Want the secret to an amazing skin glow? The answer may surprise you. Think topical probiotics. Skin is first defense from pathogens such as bacteria and germs, our skin is constantly fighting to keep us healthy. And sometimes that hard fight shows which makes skin look dull and sluggish. 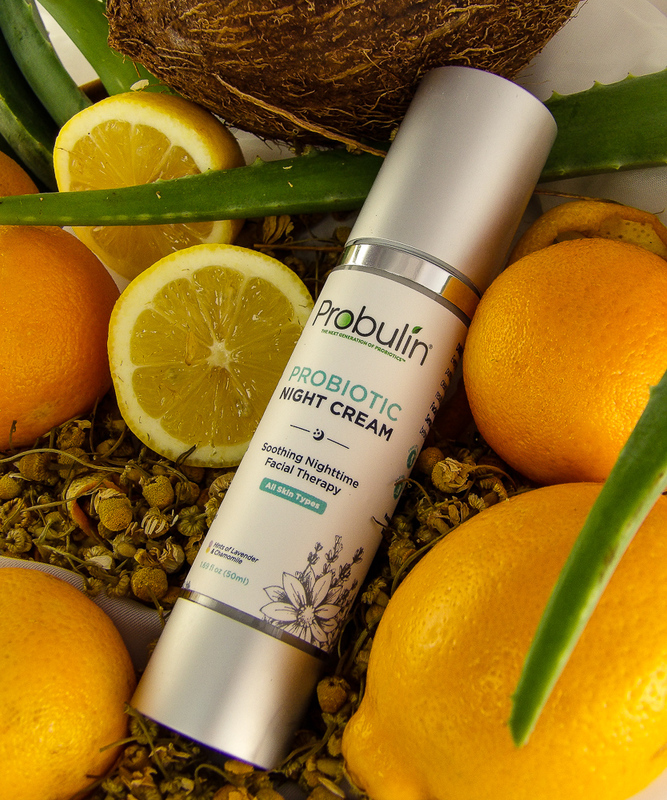 By topically equipping skin with the Probulin Probiotic Skin support topical system, not only is the body healthier, but the skin becomes more resilient to topical irritants and looks better because skin renewal is supported, better moisturized, and brighter. 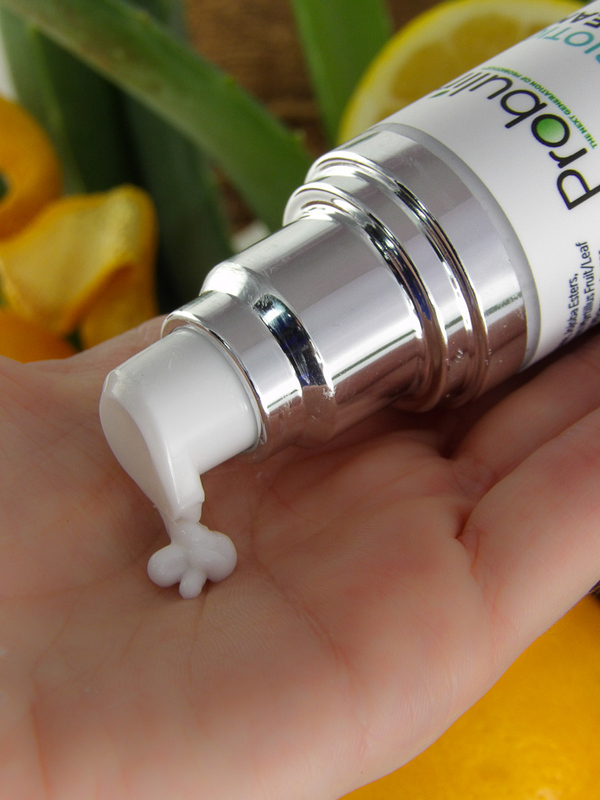 Taking oral probiotics for clear skin is an increasingly common beauty trick. 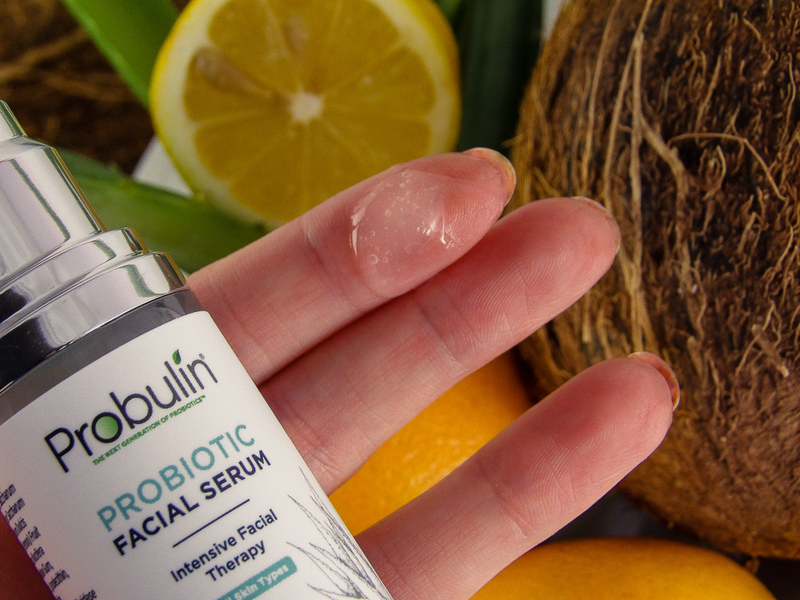 While probiotics are most often associated with digestive health, many report an improved appearance of their skin when they take oral probiotics. This makes sense because as the body’s largest organ, skin can derive benefit from anything that improves our overall health. But that’s only half the battle. If you ever used a Yogurt face mask you know that good bacteria makes skin look good and feel soft while calming irritation and inflammation. Skin inflammation, the natural reaction to foreign toxins, ravages skin by causing distorting swelling that results in stretched skin and eventual sagging and wrinkles. 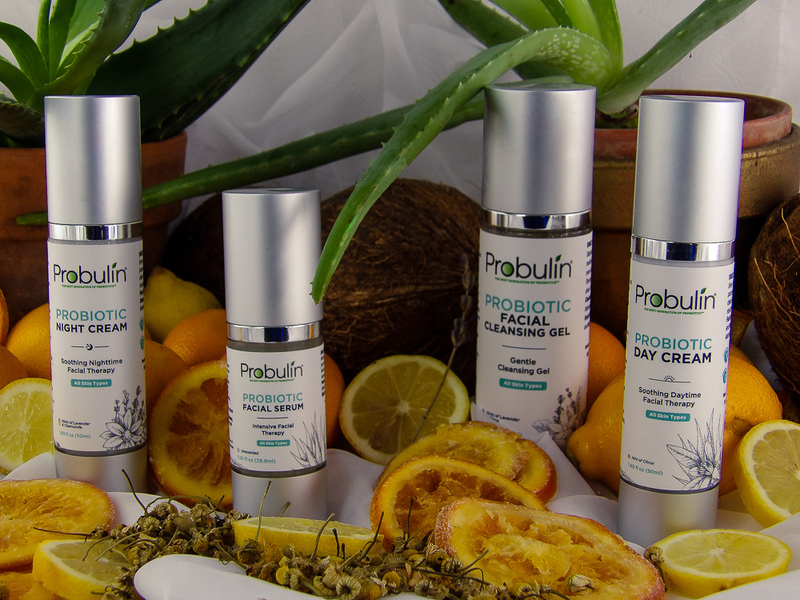 Just like topical Vitamin C serums best equip skin to make collagen by supplying vitamin C precisely and locally, topically applying probiotics stops inflammatory responses by eliminating the source. 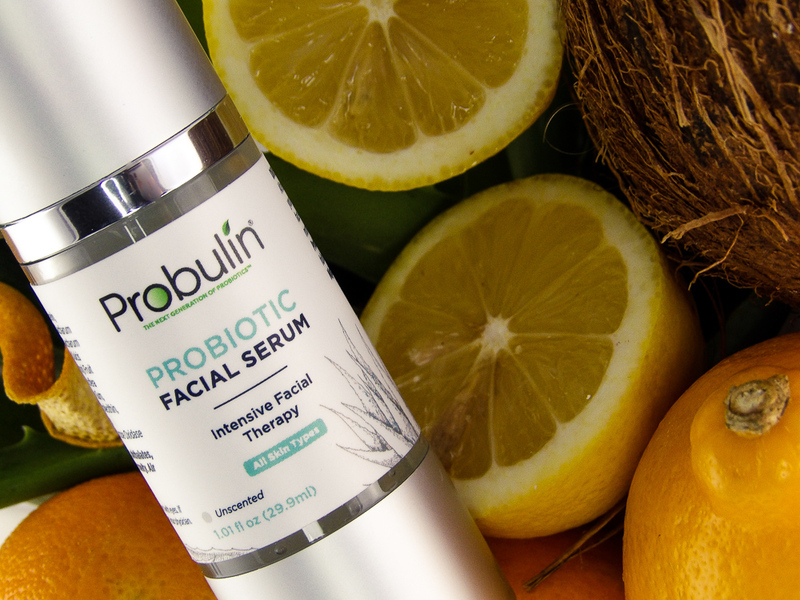 But the benefits that can be gained from topical probiotics use go well beyond what a DIY home facial can achieve. 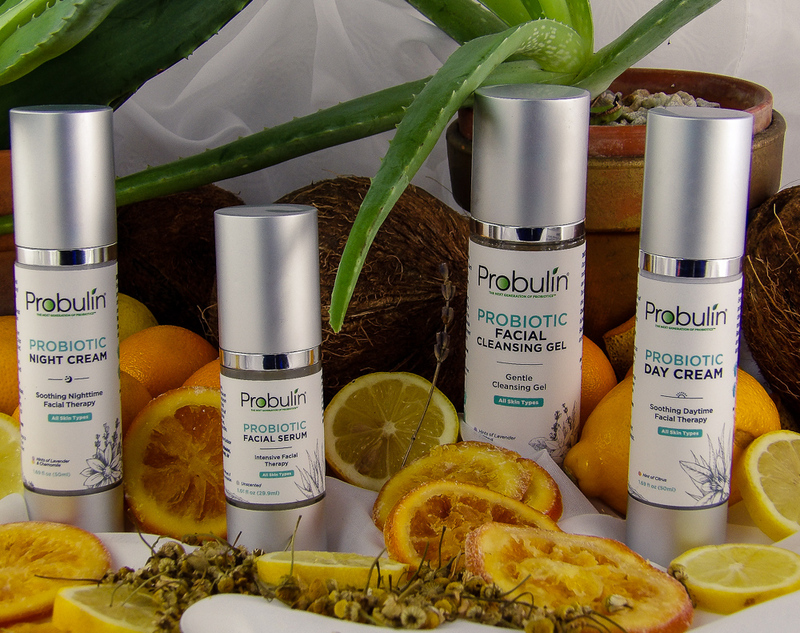 Probulin’s line of skincare ranges from cleansers to eye creams and uses 7 to 12 healthy bacteria strains in each product, giving the skin flora the optimal balance. 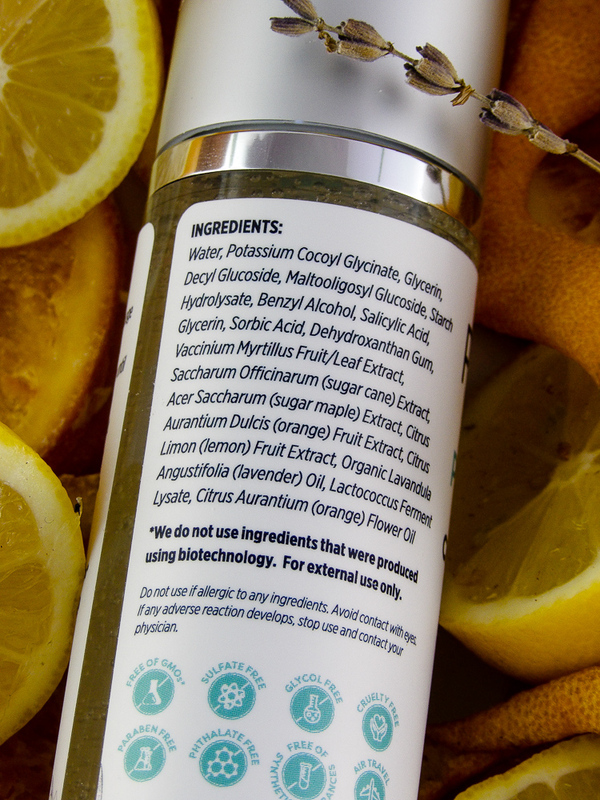 It also contains numerous naturally nourishing, hydrating ingredients like African Marula Oil, Shea Butter, and organic Aloe Vera, Coconut and Vitamin C from lemon and orange, that encourage skin to look its’ best and can even achieve a younger look by undoing the ravaging effects of sun damage, dark spots, and inflammation. 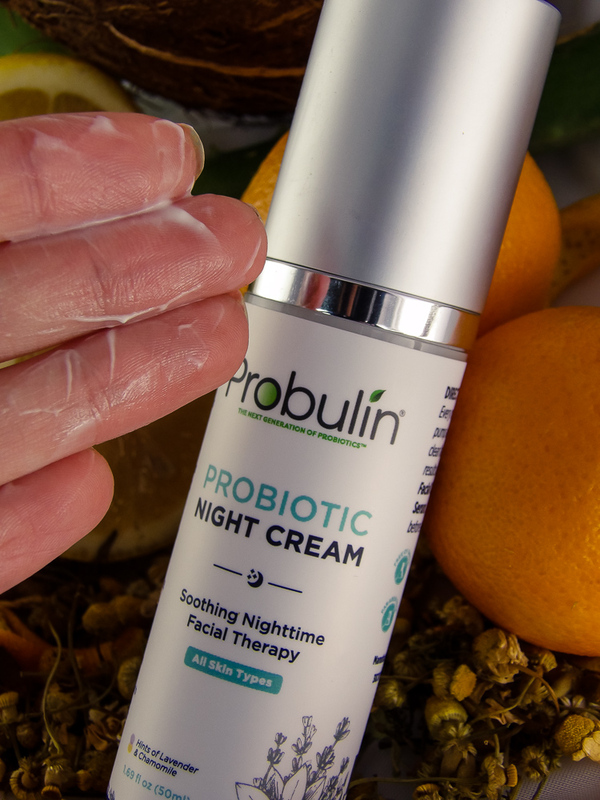 Probulin probiotics support unseen skin health processes that contribute to the skin’s natural regenerative and defensive mechanisms. The products are also very gentle so they don’t dry it or strip it the skin of vital oils or nutrients. 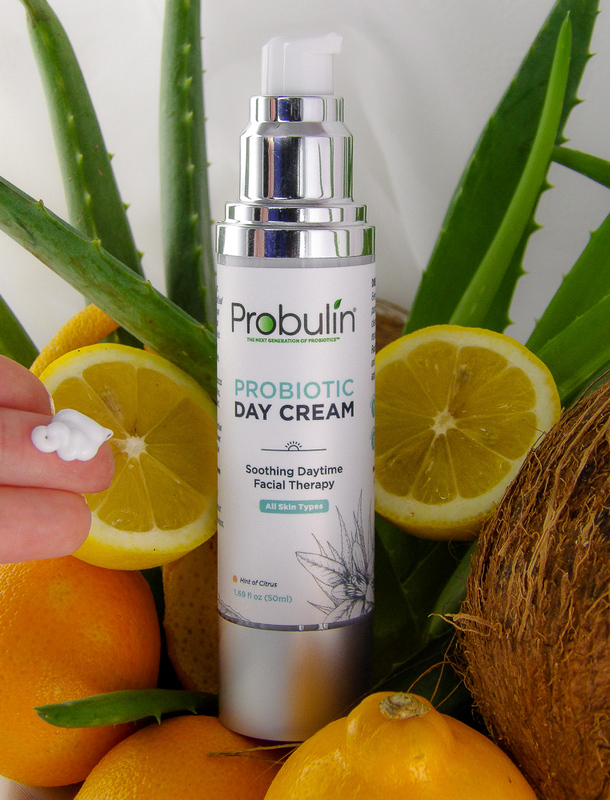 When applied topically, probiotics also benefit skin health by providing moisture, UV radiation protection, as well as support the mechanisms that produce brighter and healthier skin, and speeding skin renewal. 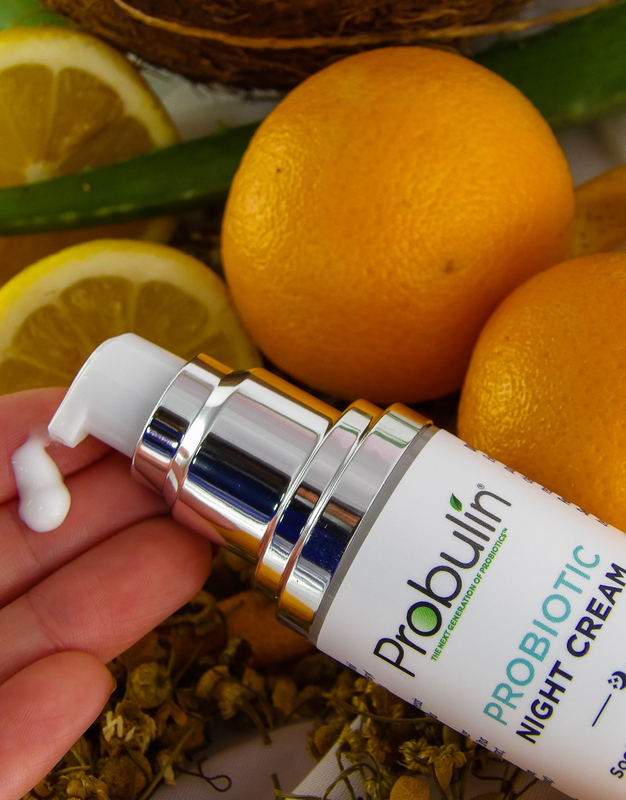 All Probulin products are formulated by a team of two doctors: a board-certified Naturopathic Doctor and a prominent gastroenterologist and author who works extensively with Probiotics. 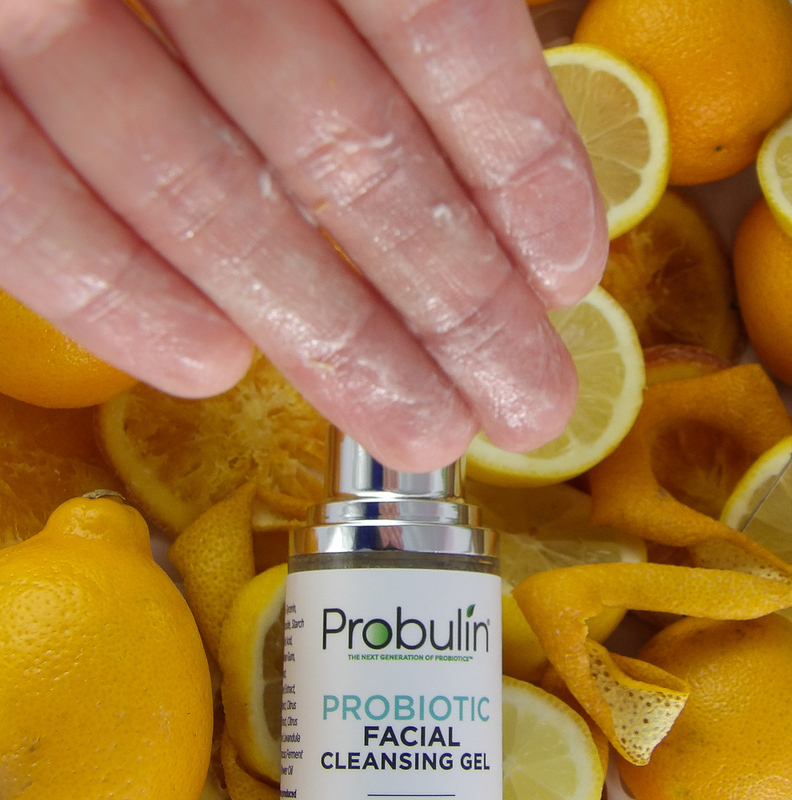 Probulin is Non-GMO, Gluten Free, Soy Free, Wheat Free, Dairy Free, and Magnesium Stearate Free. 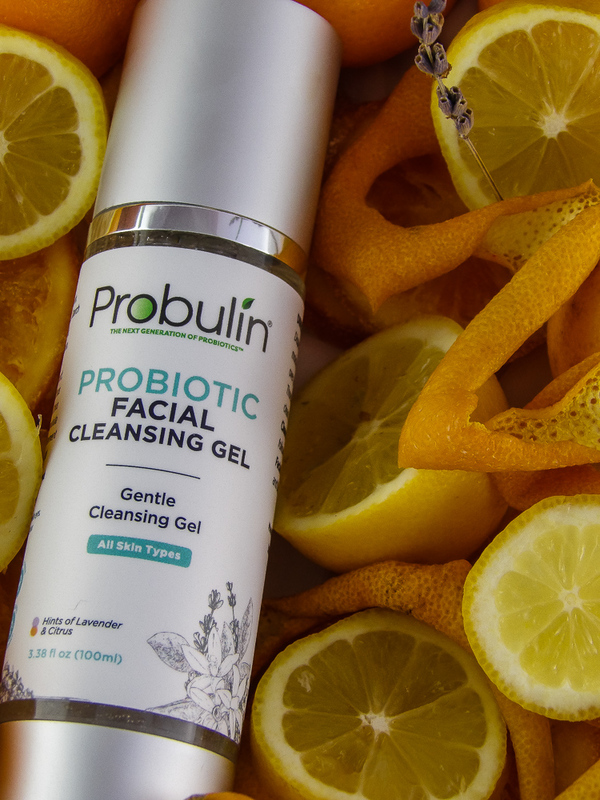 We tried four products of the Probulin line: the Probulin Probiotic Facial Cleansing Gel, Probulin Probiotic Facial Serum, Probulin Probiotic Day Cream, and Probulin Probiotic Night Cream. The cleanser is the first step in the system. 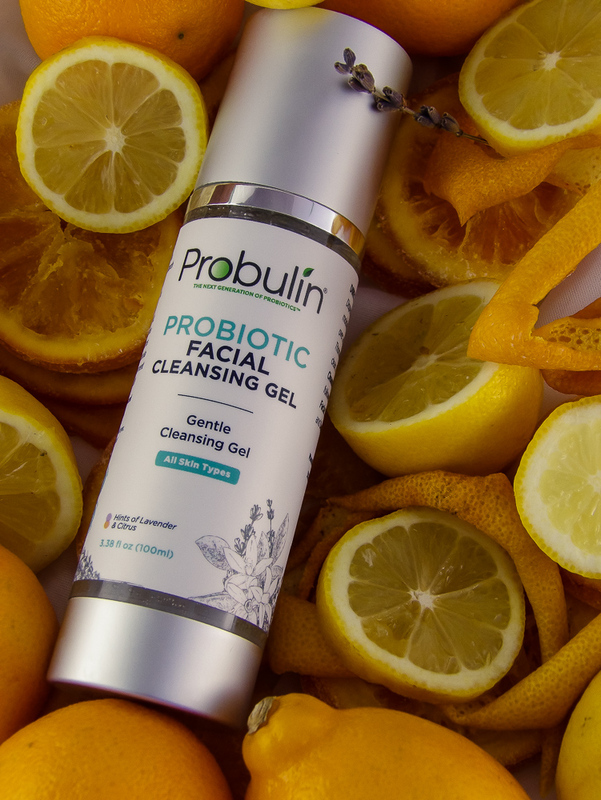 Probulin Probiotic Facial Cleansing Gel is a gentle made for all skin types with a natural hint of lavender and citrus. 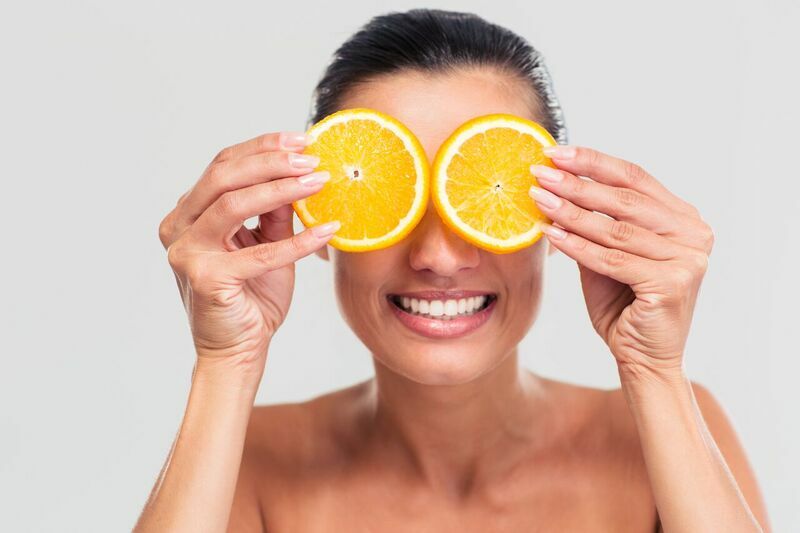 Made with Sugar Cane extract, Maple Sugar extract, Citrus Aurantium Fruit Extract (Orange), and Lemon Fruit Extract, the high Vitamin C base helps make skin brighter and visibly healthier. The scent is light and pleasant, it creates a soft foamy light lather and washes away clean and skin does not feel tight after use. 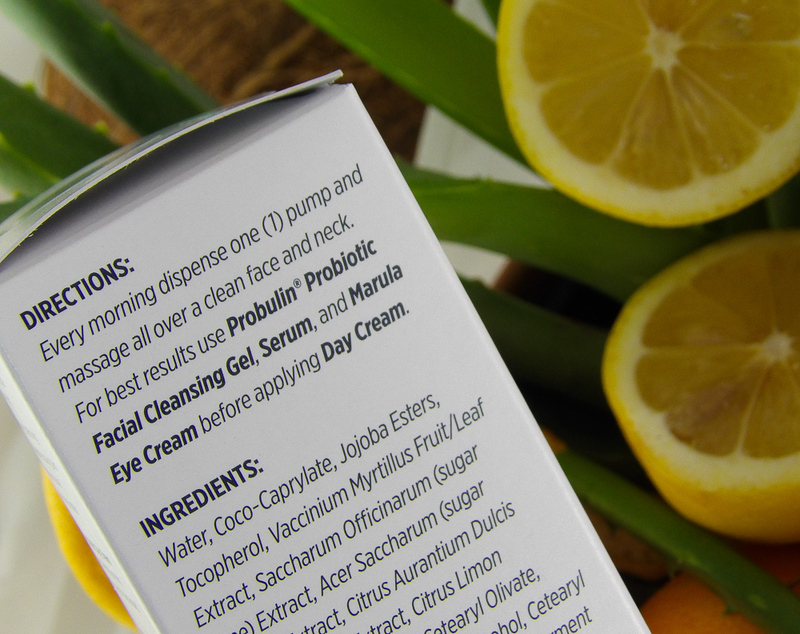 What’s so special about this cleanser? 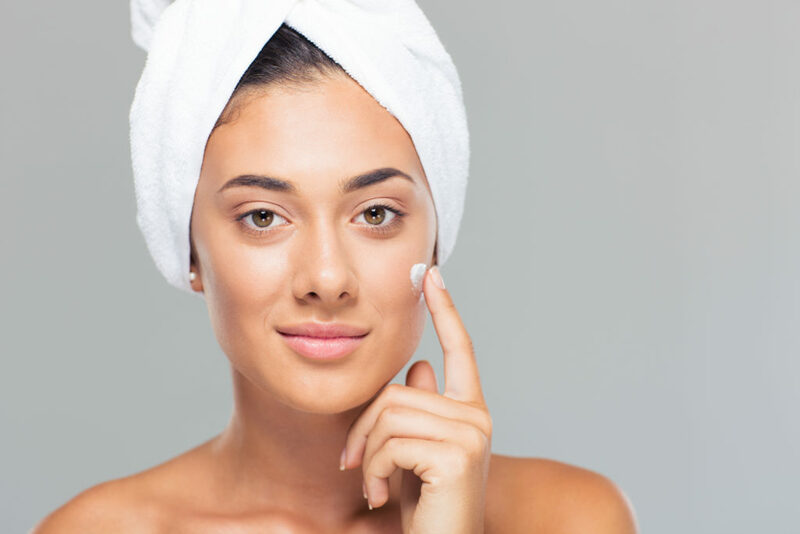 Skin, like your gut, has an ecosystem that requires a delicate balance in cleansing so as not to unduly strip away good bacteria and natural oils. 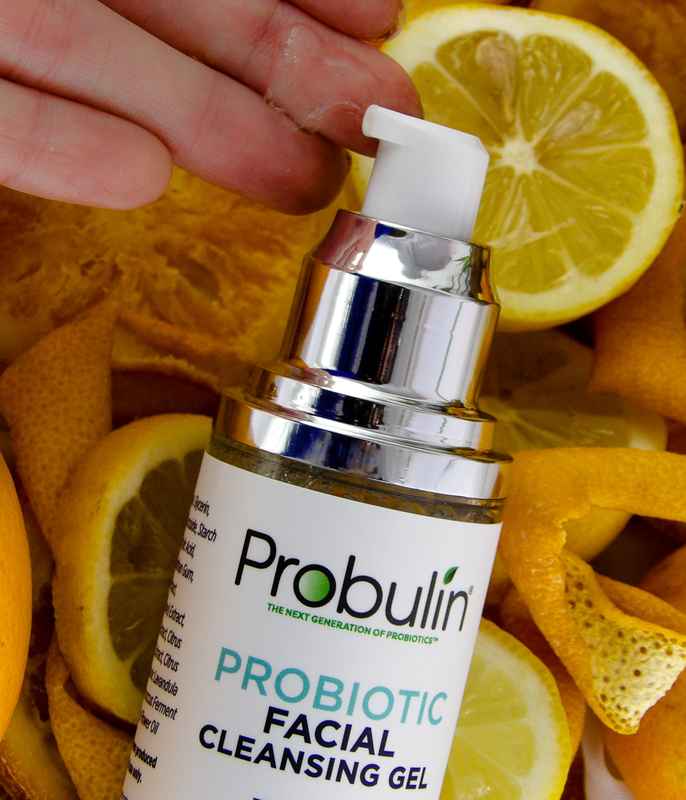 Unlike most cleansers that strip away healthy nutrients, moisturizing oils, and good bacteria that promote and maintain skin health, Probulin cleanser retains the helpful bacteria and oils, resulting in less skin dryness and premature wrinkles. It is to be used twice a day before applying the eye and face creams and the intensive serum. I also felt the Cleansing gel makes my skin appear noticeably brighter. 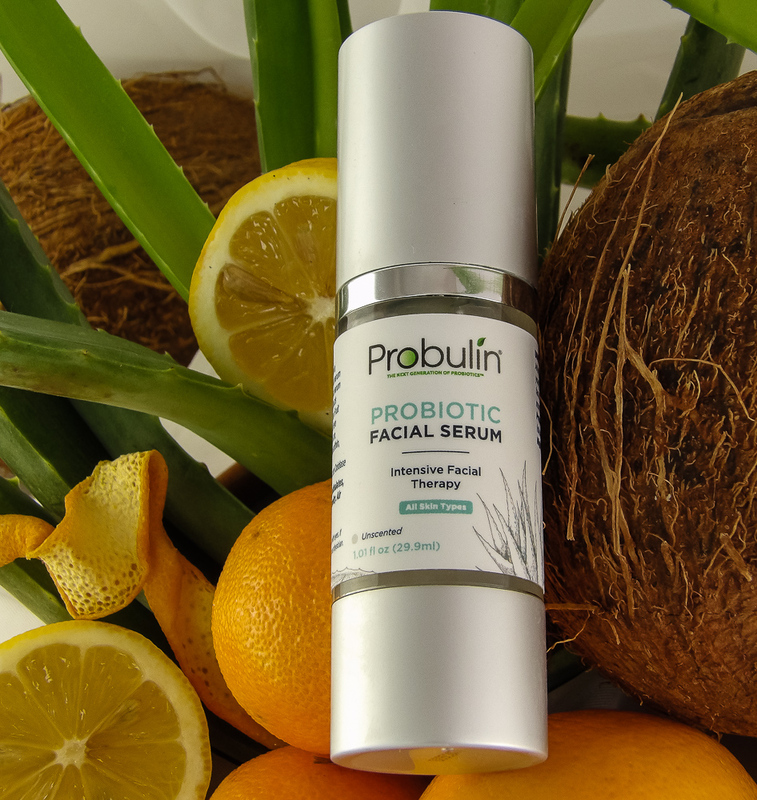 Probulin PROBIOTIC Facial Serum is an intensive treatment, it is applied prior to the other creams including the day cream or eye cream immediately after cleansing. While the skin is not left dry or stripped of natural oils from the cleanser, the intensive cream still offers a balancing dose of intensive hydration. Only a small bit is needed for the entire face, apply sparingly focusing on areas that could use some extra attention such as forehead and around the mouth. 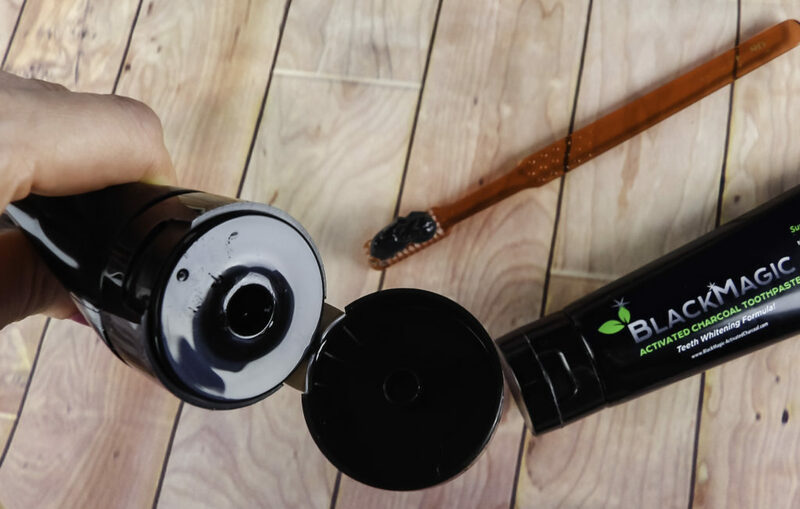 It absorbs quickly and leaves a dewy but not sticky finish. Of note, the serum is unscented. After the Serum is applied, follow up with the Day Cream. It is a light texture that does not feel sticky or heavy on the skin. My makeup applies smoothly atop the cream, with no pilling or melting. The scent is pleasant and my skin feels silky smooth. 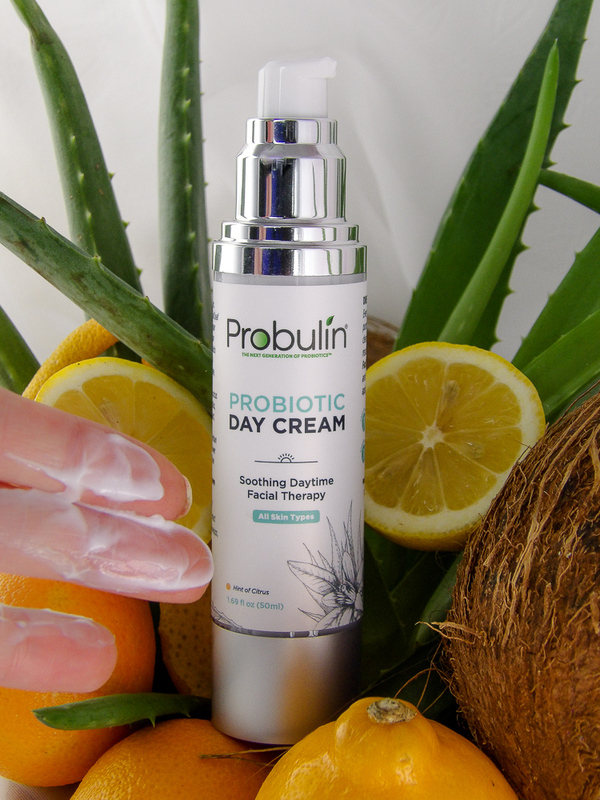 Fast absorbing Probulin Probiotic Day Cream keeps skin protected while facing pollutants, germs, and toxins plus makes skin glow! The Night Cream is light, creamy fluid that absorbs quickly into the skin. My skin just drank it in and it left a dewy but not sticky glow. I really like how great my skin looks when I awake in the morning: soft, dewy and fresh as if I got a great nights’ sleep, even when I didn’t. 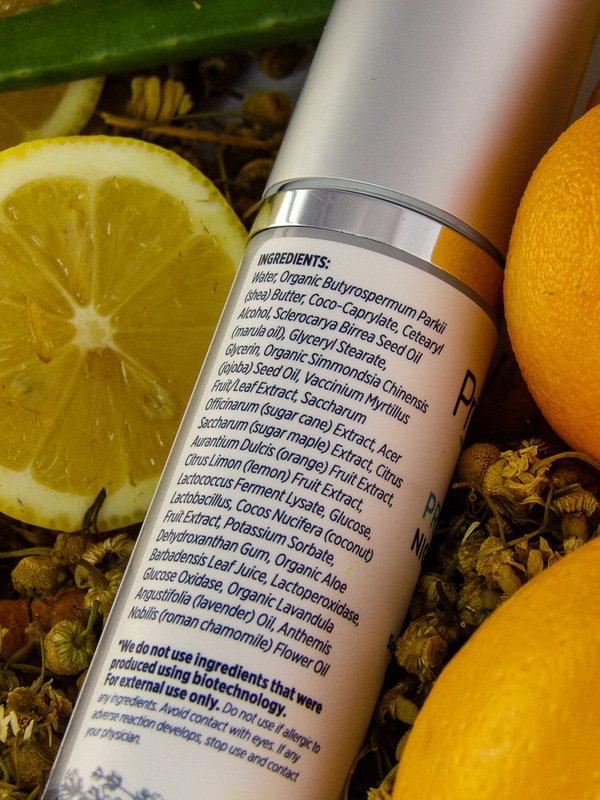 On the whole, with the combination of products, my skin is less irritated and appears brighter and smoother. I love the glow and evenness of my skin tone, it looks healthier and I look more awake. I didn’t realize how my skin looked somewhat sluggish even when wearing makeup until I saw how healthy it could look without foundation. 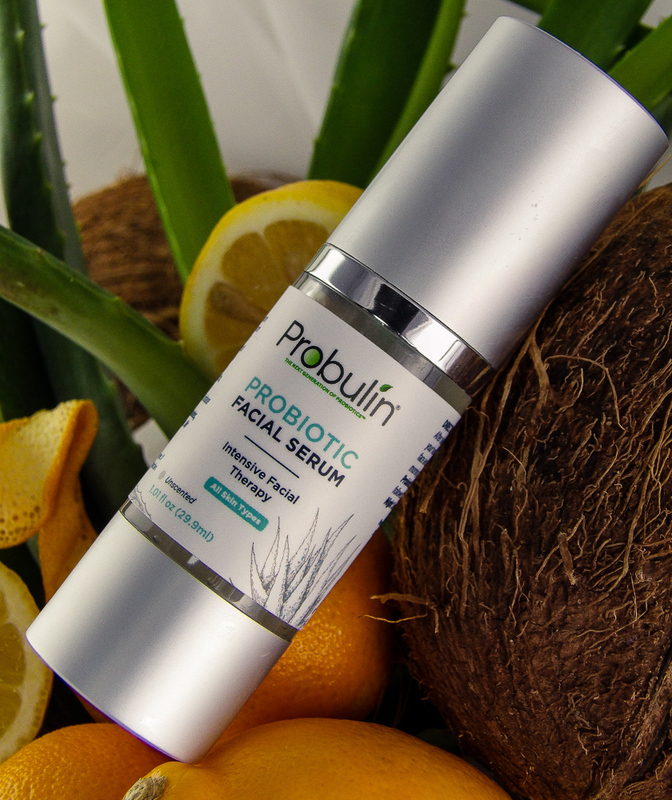 The Probulin line of Probiotic topical skin care treatment provides the skin with the defenses to counteract pathogens while promoting skin renewal processes. 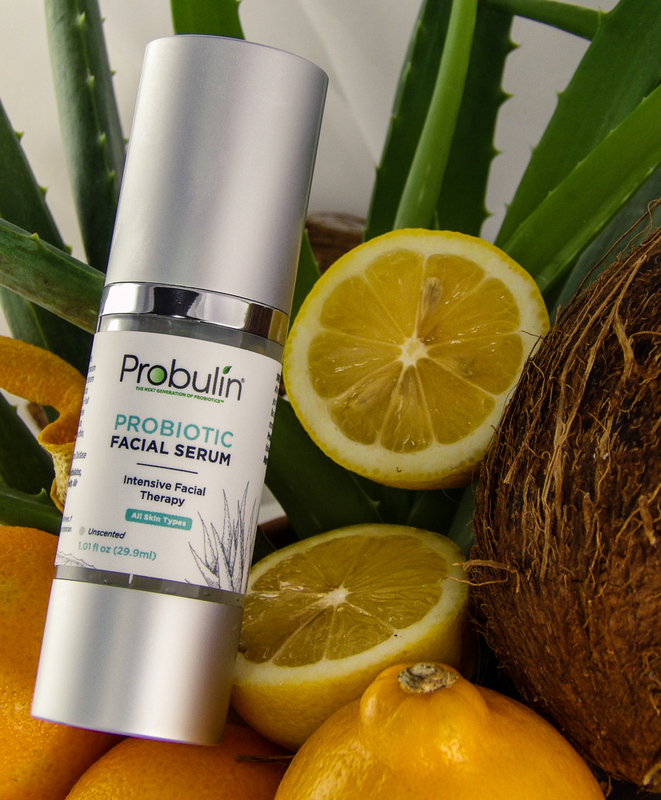 When paired with an oral probiotic, the skin can attain its’ optimal balance for healthy skin that glows! The cleanser washes away clean and the Day Cream, Serum and Night Cream absorb well without a greasy feel. I find that inflammation and redness are reduced while using the products and I am experiencing few acne breakouts. My skin looks fresh and dewy. 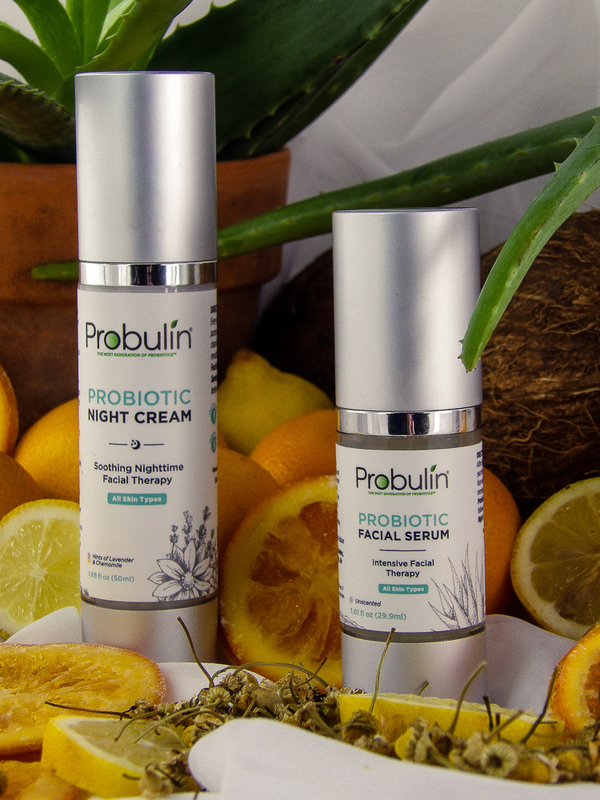 Don’t rely on makeup to glow, get a natural glow from probiotic products that improve your skin by supporting the body’s own natural mechanisms to promote skin health and renewal. Style Chicks received Probulin Skincare products in exchange for our unbiased review and received compensation for our time and effort. However, our experience with the product and the opinions expressed in this review are 100% ours. We’ve long said goodbye to summer, but the sun, saltwater sea waves, and breezy wind stay with us. Not metaphorically, but literary by how they dry and damage the hair, especially delicate curly hair. If you have any texture or curl to your hair, summer can really do a number on you, causing unruly frizz and brittle, dryness to your locks, and a loss of curl manageability. Yearning for sleek, shiny smooth Veronica Lake hairstyles to go with your my autumn and fall wardrobe? Then it’s time for a hair intervention. 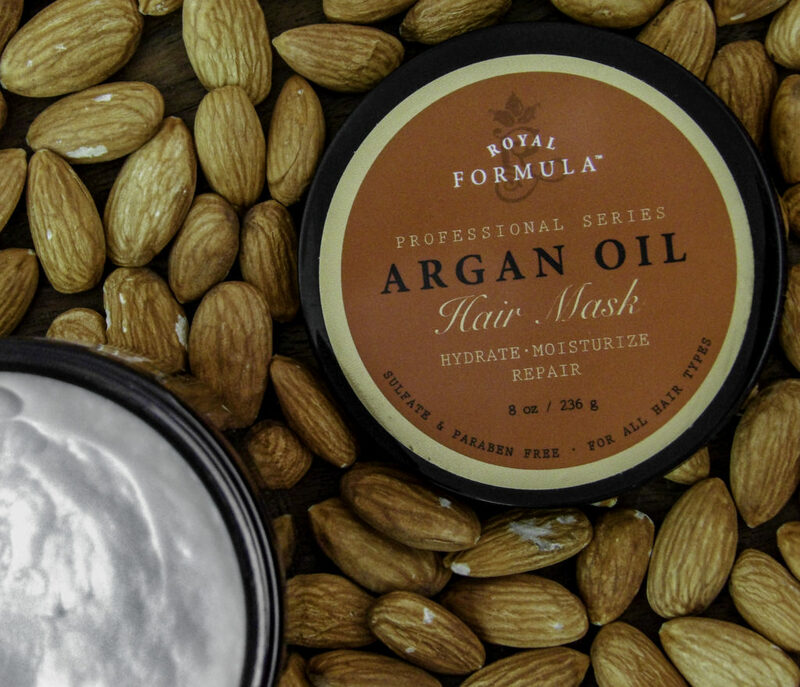 We tried Royal Formula Deep Conditioning Argan Oil Hair Mask, an organic formula of luxe ingredients that smoothes the frizzies, make hair feel thicker, strong, soft, shiny and manageable again. WHAT IS ALL THE FUSS ABOUT ARGAN OIL? 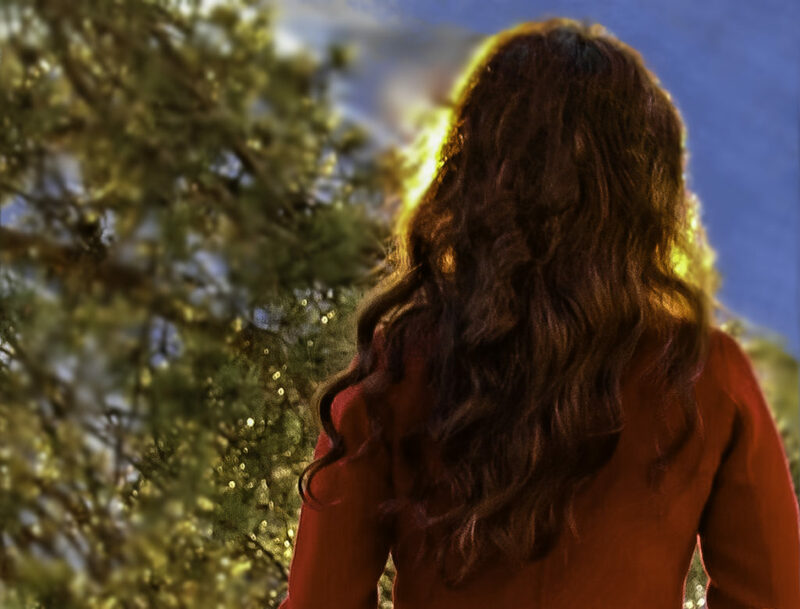 Argan Oil is very popular for topical skin care, but how do you use it to revitalize hair? 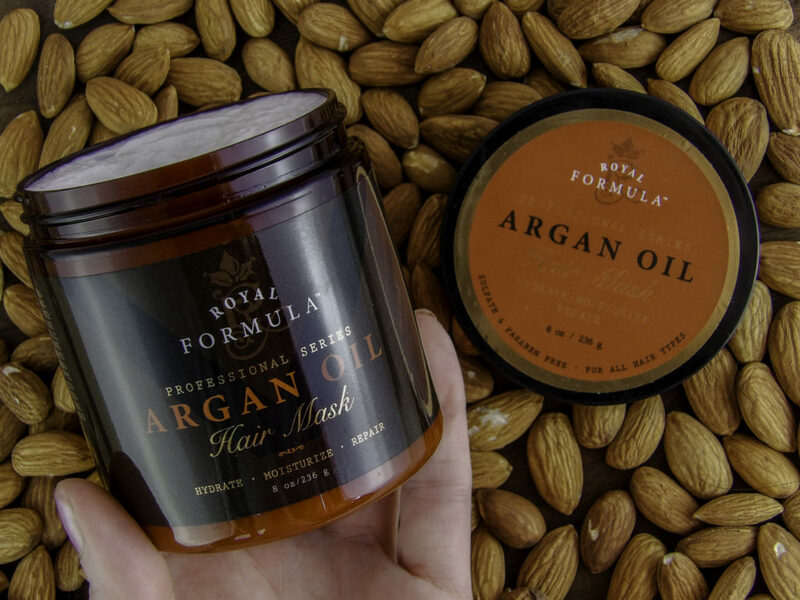 Argan Oils’ claim to fame is promoting hair strength and hair growth, which means application directly at the scalp level and massaging it in well. The problem is straight Argan Oil is difficult to wash off, and it can suffocate the scalp, trapping oils and dry skin, which causes more dry hair problems. Argan Oil also works on the hair body itself, by coating the hair shaft, which is a boost for curly hair that has been damaged and is extra porous. The result is it adds a glossy, natural shine and gives a smoother appearance to split ends and lifeless hair. While Argan Oil is highly effective, it works best when paired with other key ingredients, such as within a hair mask. 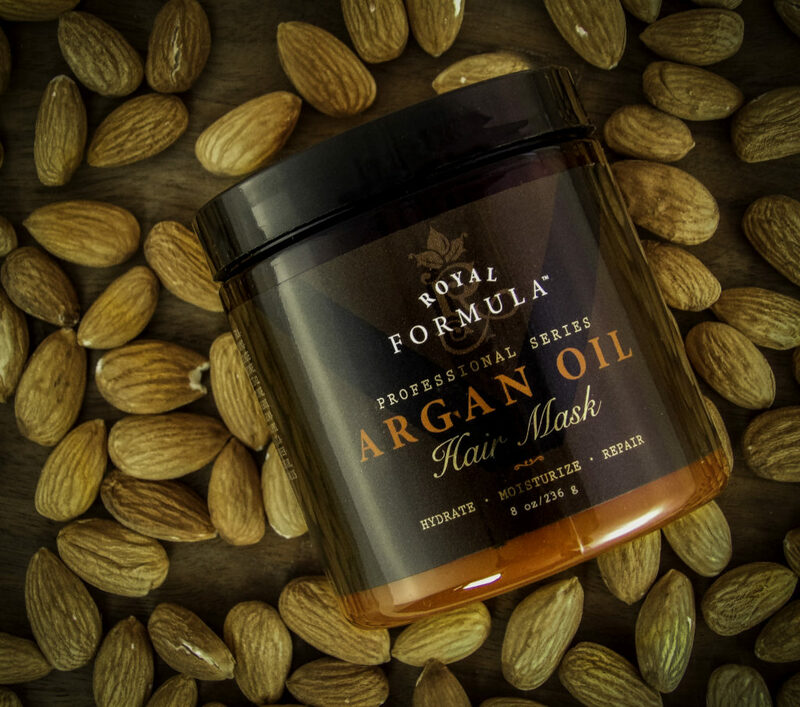 Royal Formula Deep Conditioning Argan Oil Hair Mask is a luxurious, creamy-textured hair conditioning mask gives more manageable, silky-smooth, healthier looking hair. The smell is pleasant and clean. The combination of ingredients makes for an all-in-one conditioning formula that addresses whatever is making your hair lifeless, whether it is too much sun, pool chlorine, or over-use of hot styling tools, overprocessed hair coloring, too much processing, or a combination of any of the above. WHAT KIND OF HAIR CAN ROYAL FORMULA ARGAN OIL HAIR MASK HELP? All hair types can benefit from the shiny imparting restoration of this hair mask, especially hair that is dry, damaged, Color-Treated, Bleached or chemically processed. If you use hot styling tools, Argan Oil can do wonders for the hair. Not only will hair be more manageable and sleek after conditioning, but the Argan Oil helps the hair withstand the heat of a flat iron. Hot tools dry out the hair and rough up the hair shaft. 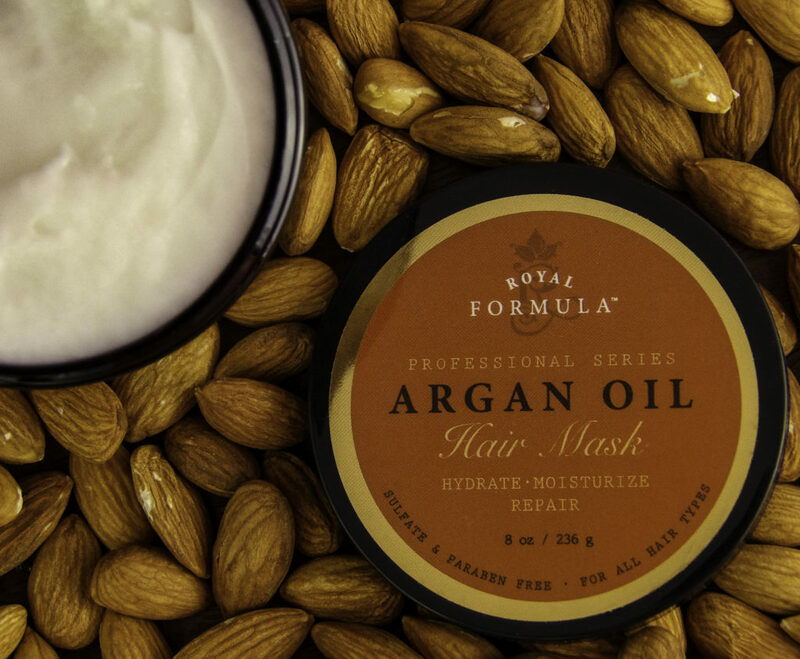 Royal Formula Argan Oil Hair Mask restores moisture into the hair shaft. Pure Argan Oil: coats the hair shaft to condition, nourish, soften and smooth the hair, imparting a healthy shine. This formulation uses the Highest Quality Cosmetic Grade Pure Argan Oil. Almond Oil contains Omega-3 fatty acids, phospholipids, vitamin E, and magnesium. It nourishes and strengthens damaged hair, making it silky and shiny again. It also reduces hair loss and makes hair more elastic. Almond Oil is also a carrier oil, meaning it helps other oils and ingredients penetrate and absorb. Hydrolyzed Silk: works for stressed, depleted hair by reducing hair breakage by building protein bonds in the hair to make it strong and shiny again. It is “Hydrolyzed”, or broken down in water, from pure silk fibers into silk amino acids which are small enough to penetrate the hair follicle and scalp. Pro-Vitamin B-5 or Pantothenic acid helps hair grow and improves the appearance, volume, and elasticity of hair. 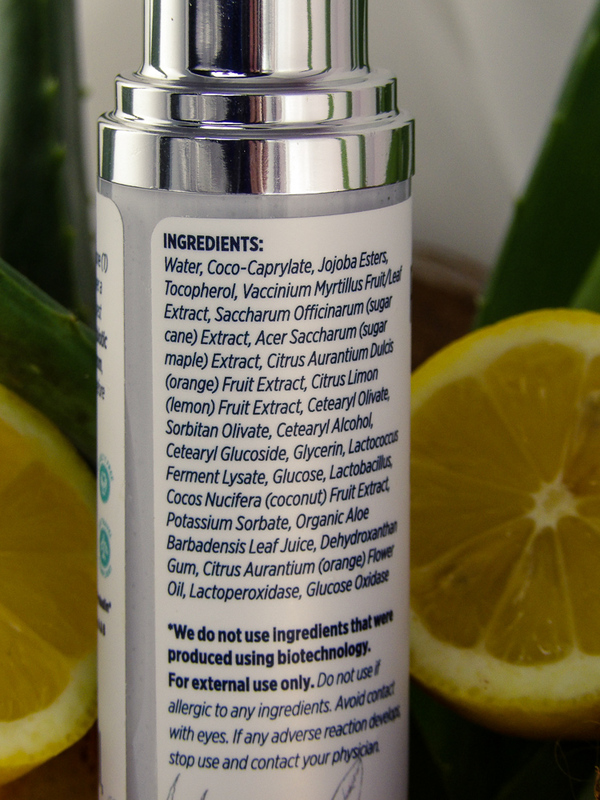 What it does NOT contain: No sodium, parabens or sulfates. My hair is about mid-back length, a bit past my bra strap. It is naturally dry and I frequently style with hairdryer and hot rollers, so it requires regular conditioning to stay in shape. Lately, my ends are looking dry, thinner and straggly. It also doesn’t have much movement, it just sort of sits there, somewhat lifeless. So it is time for a bigger trim if I can’t get my hair conditioned back into shape. Recently I have been doing blowouts, and it has taken a toll on my hair as it is more hot styling tool use than I usually tend to use. 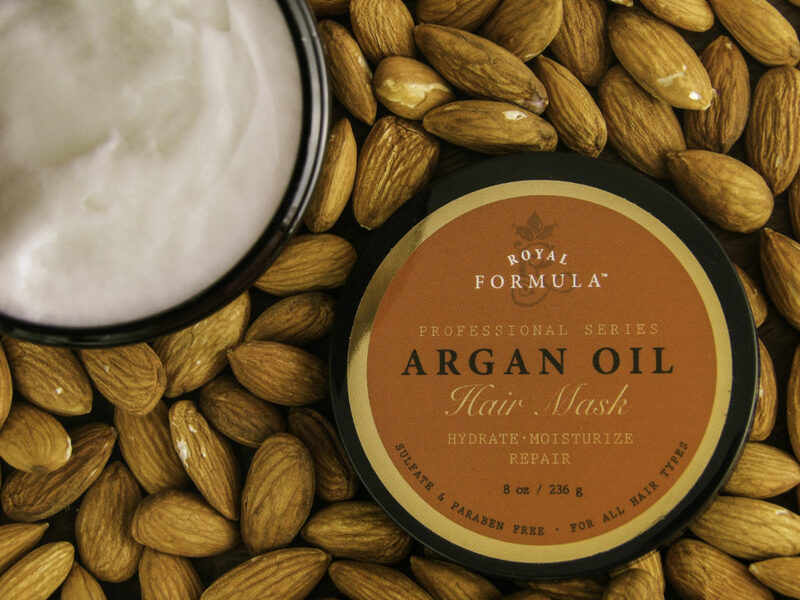 Royal Formula Argan Oil Hair Mask is creamy and thick with a very luxe feel. The scent is pleasant and clean. It rinses out easily. I could feel my hair felt stronger even in the shower during my final rinse. TO USE: Emulsify the conditioner in your hand and apply it to the scalp and hair length. Comb it through with a wide tooth comb. After one five minute treatment, my hair has less frizz, feels stronger and thicker and was easier to style. My curls no longer felt “crunchy”. I am very pleased with how it “plumped up” my fragile hair ends look and the appearance of split ends is minimized, as my hair appears less porous on the whole. It conditions hair without leaving a residue, which I like. I did a second treatment a few days later, where I left the hair mask conditioner in for about an hour and the second time my hair gained back movement and swing, even after blow drying and hot roller styling, it looked and felt so healthy and strong. It doesn’t take much product to coat and treat the hair. I plan on using it about once a week and after coloring my hair or after heavy hot styling tool use to keep my hair looking healthy and feeling so soft and touchable. It can be used up to three times a week. While it does a very good job in five minutes, I like using it as a leave-in mask for about an hour for intensive conditioning. 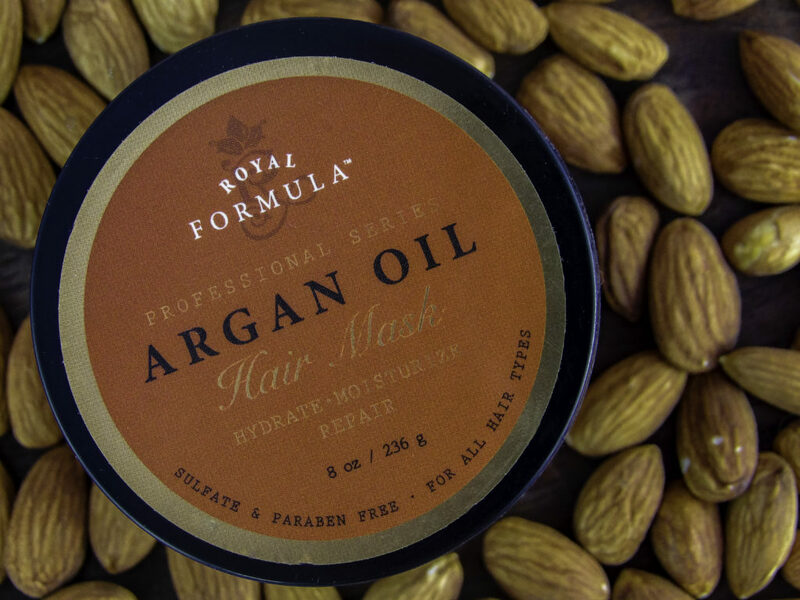 Royal Formula Argan Oil Hair Mask is a luxe formulation of vital hair replenishing ingredients, this hair mask is ideal for hair that needs to recover from over-processing, coloring, hot styling tools, or too much summer sun. While I am still doing a hair trim, it will be more of a dusting than cutting off a few inches. 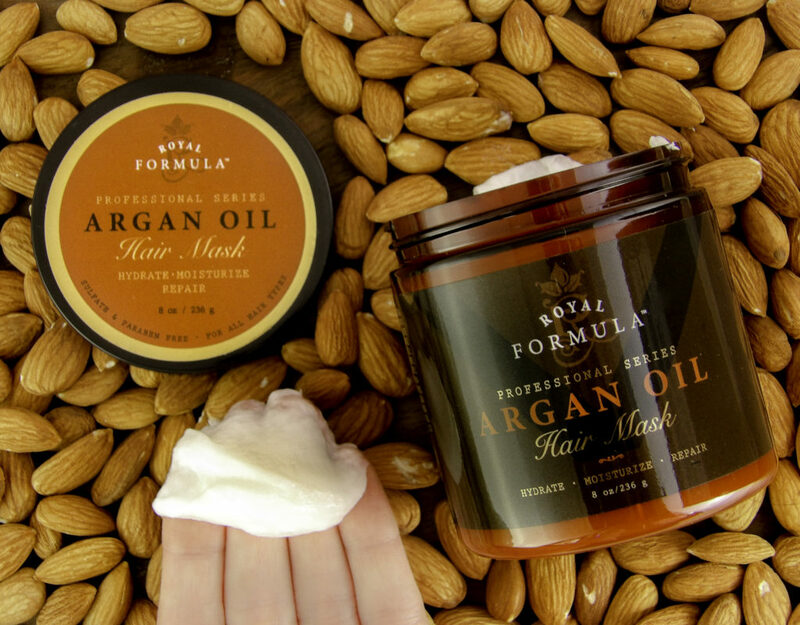 Yay, Royal Formula Argan Oil Hair Mask! I am very pleased to be able to keep as much hair length because the mask brought my hair back to life. I like the organic formula that contains a cosmetic grade Argan combined with Almond Oil, B5, and Silk Proteins to make my hair look so much healthier and feel so very soft. Style Chicks received the Royal Formula Deep Conditioning Argan Oil Hair Mask in exchange for our unbiased review and received compensation for our time and effort. However, our experience with the product and the opinions expressed in this review are 100% ours. Nothing beats a relaxing soak in the tub, which is in part, why Bath Bombs, A.K.A. “Fizzies”, are so popular. 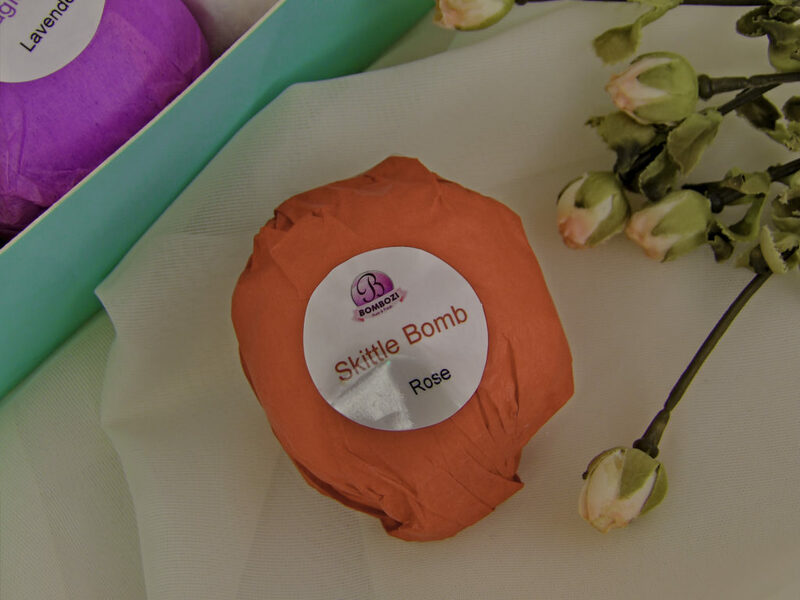 A great gift for moms, sisters, friends, and yourself, Bath Bombs are delightful to receive. 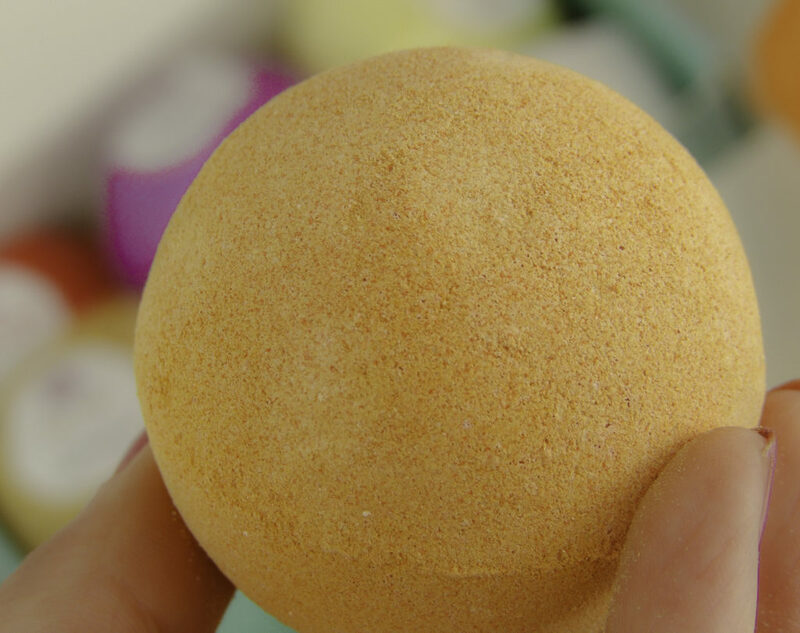 There are three problems with bath bombs, however, some contain harsh chemicals you may not wish to bathe in, bath bombs can be pricey and they often come at the price of lots of post-bath clean-up. None of these is an issue with the organic Bath Bombs by Bombozi. 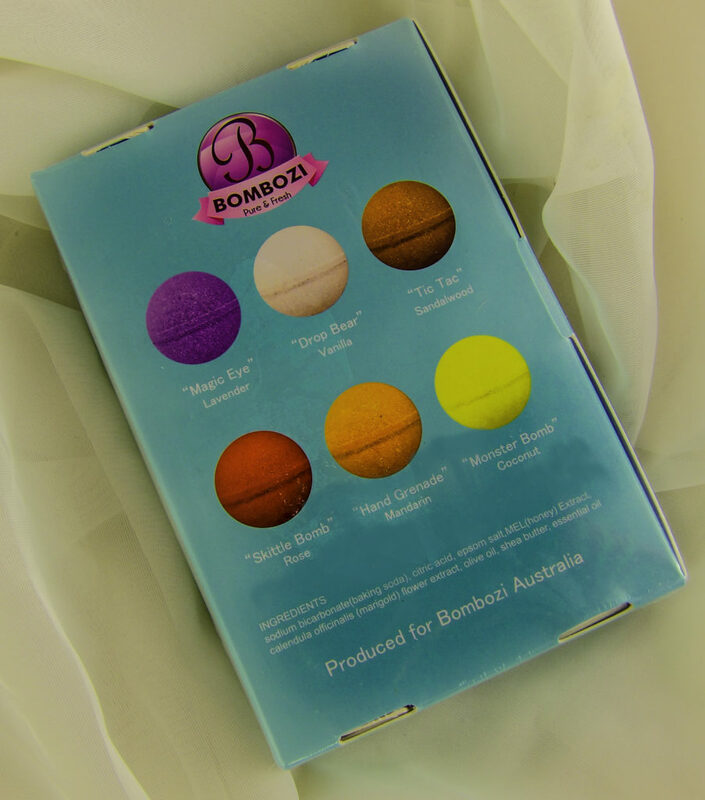 Enriched with essential oils and softening Shea Butter, you will feel safe using or giving Bombozi Bath Bombs as you’ll recognize every ingredient listed on the gift box. 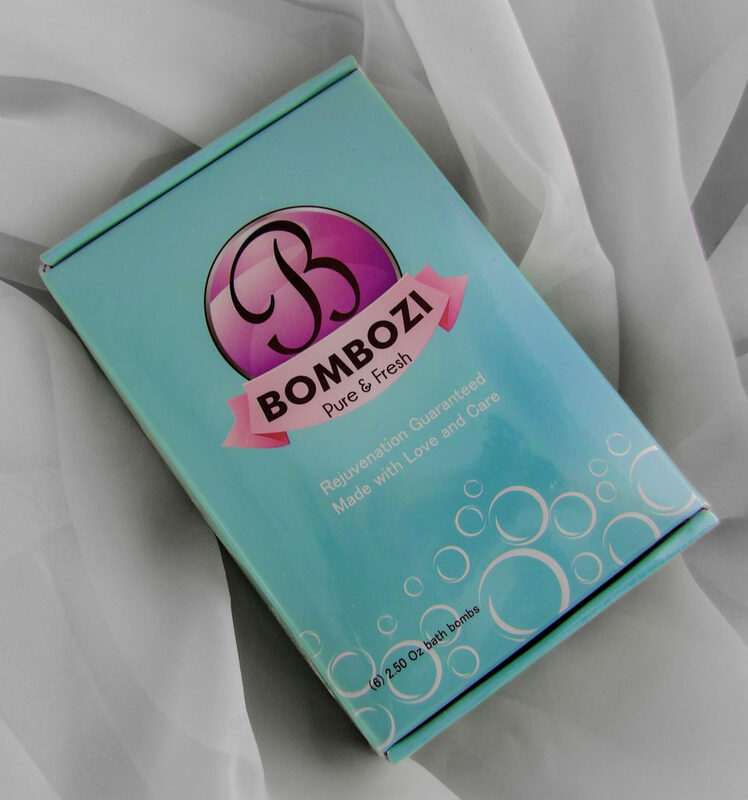 Bath Bombs by Bombozi are handmade, organic and cruelty-free, containing no harmful chemicals. 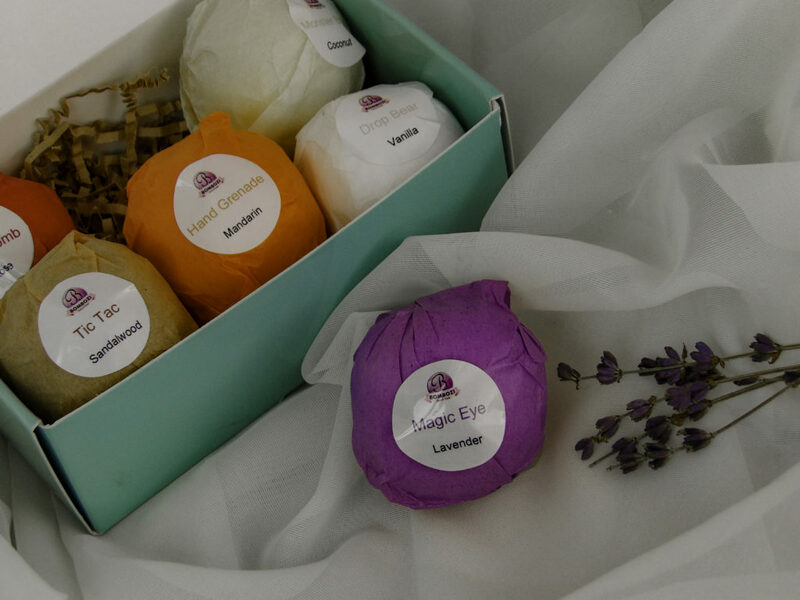 Rather, they are enriched with highly moisturizing and beneficial Shea Butter, Essential Oils, Epsom Salt, Honey, Marigold Flower Extract, and Olive Oil. Ideal for naturally leaving dry skin soft. 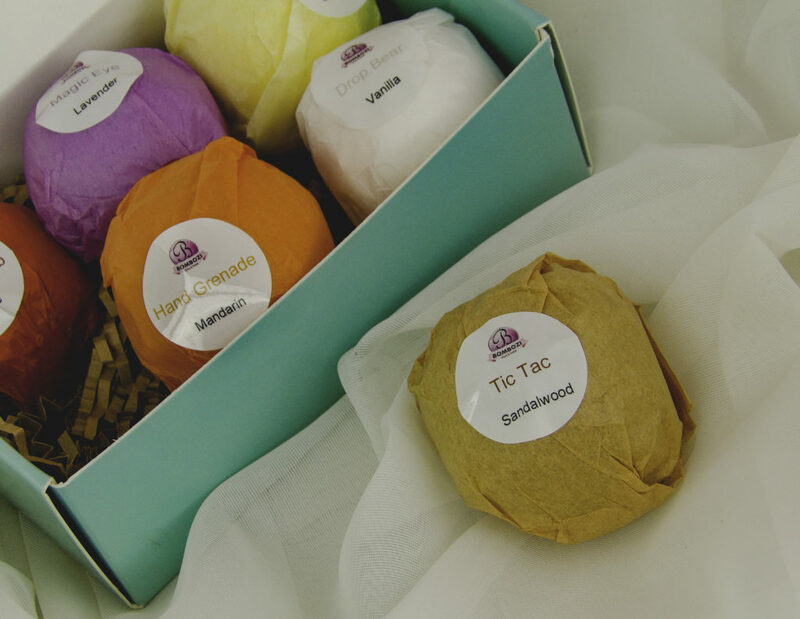 The Bath bombs come in colorful gift packaging that doesn’t require any further wrapping to give them as a gift and have decorative gift shredded paper nesting to display the gift contents inside the box. 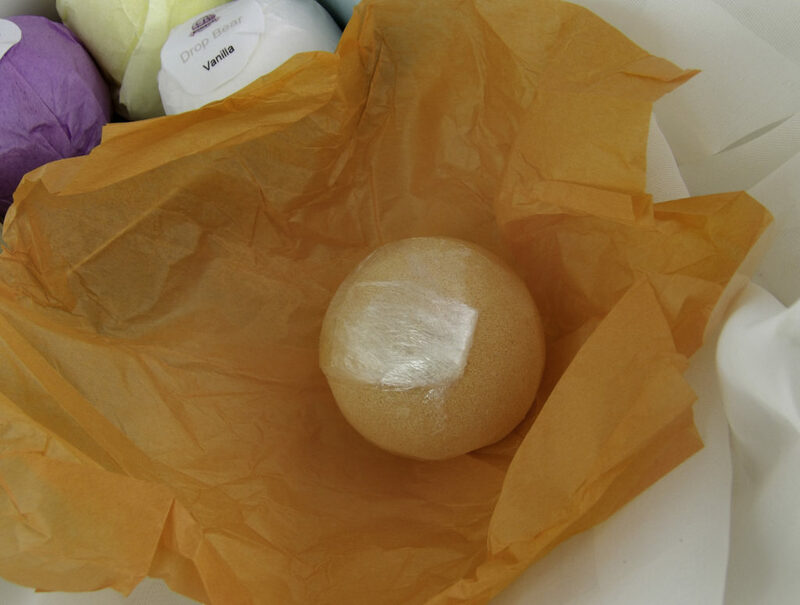 The box is quite sturdy to store the bath bombs and comes with a plastic overwrap to keep the gift box itself in good condition. 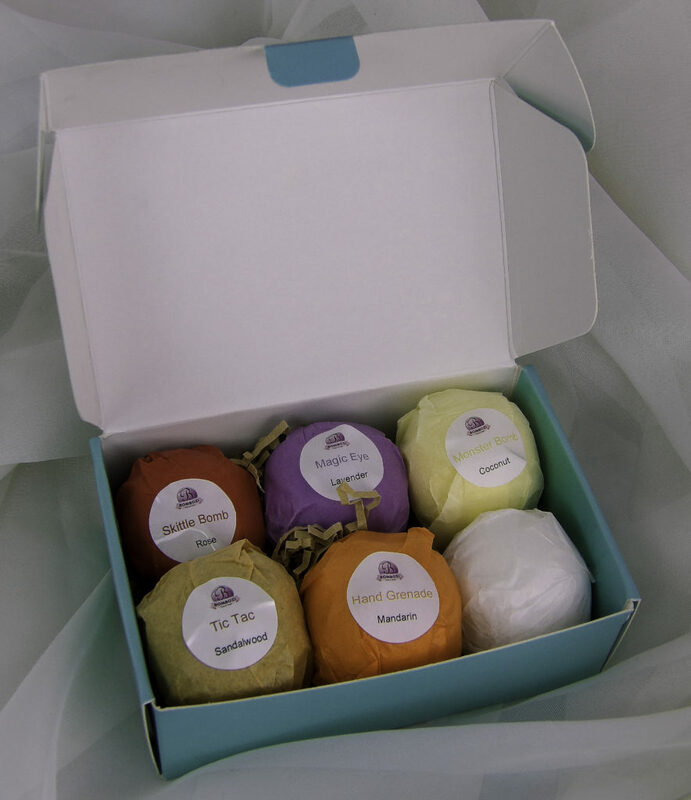 The box contains six assorted bath bombs that are 2.5 ounces each. 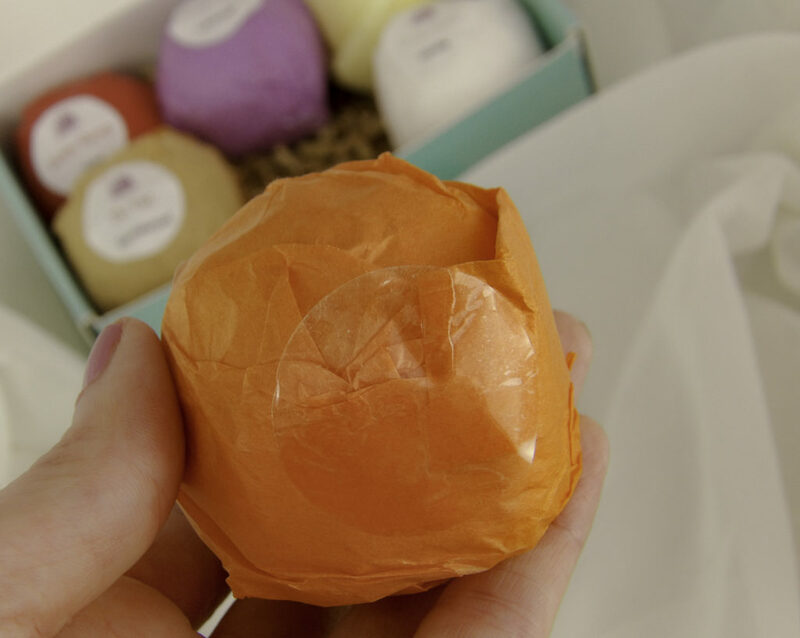 Each bath bomb is individually double wrapped with shrink film and color paper to keep the freshness and the scent intact. There is also a plastic inner wrap to keep the bomb intact and seal in the freshness and the scent. 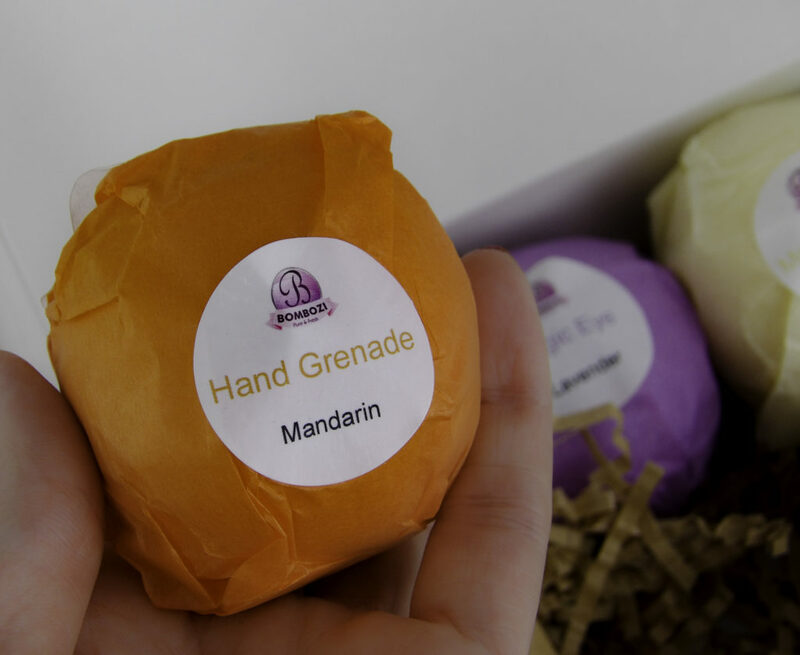 Despite the affordable price point, these are luxury quality bath bombs, I find them comparable to those sold at $10+ per bomb at specialty shops, but they do not contain ingredients that can stain the tub or leave a residue on the skin. The bath-bombs are cruelty-free. 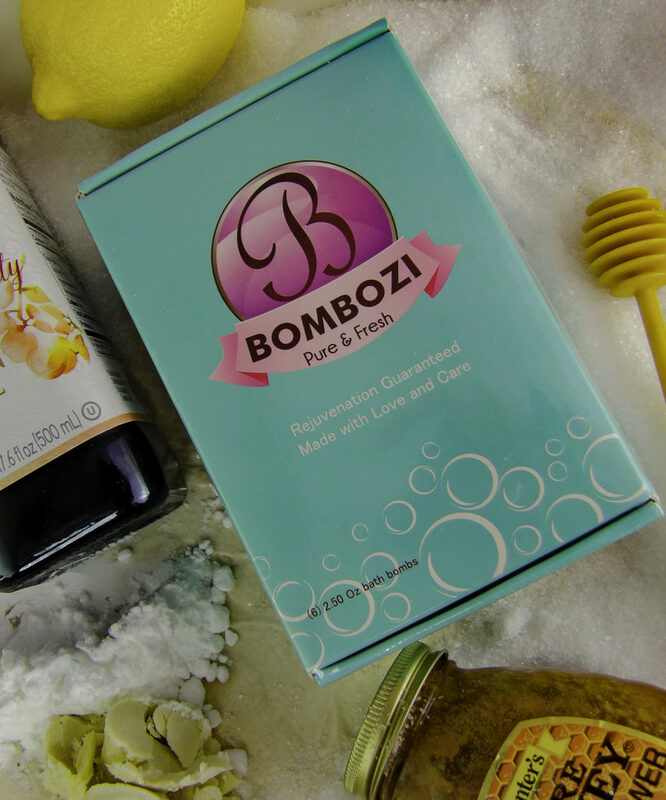 Bombozi does not test on animals, and each bomb is produced without exploitation of people or planet. You can, however, be comfortable using them, as the ingredients are clearly listed on the packaging and are known to be safe even for sensitive skin. Fill the bathtub at least halfway with warm running water. Add one bath bomb into the running water. Let it dissolve in water. Crumble it by hand if you wish to make it dissolve faster, or watch it spin around the tub creating fuzzy foam! 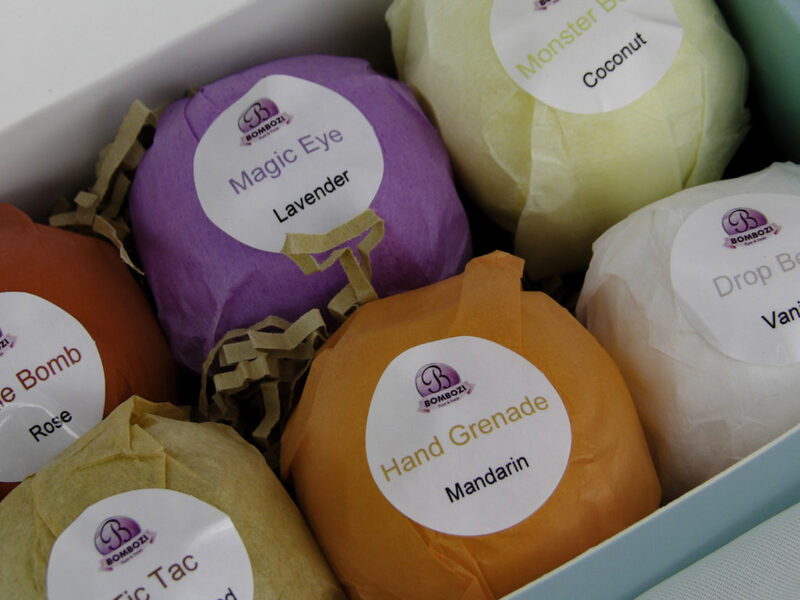 Each bath bomb will last for about 10-20 before maximum moisturizing benefits are derived. Towel dry and massage in the moisturizing effects left on the skin. I must say, these Bath Bombs really bring it! 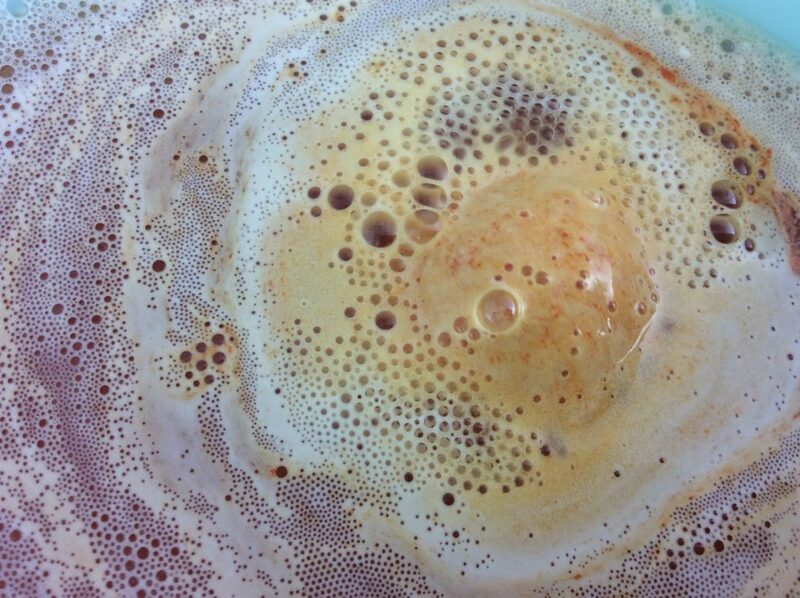 While I prefer all natural, organic Bath Bombs, realistically, many of them just don’t have the fizzy, colorful “bomb” capabilities that bath bombs with chemicals can create. But these bombs put on a show! I dropped it in the water and it fizzed and spun around for a good 7-8 minutes, and the water had a beautiful color, foam, and scent! 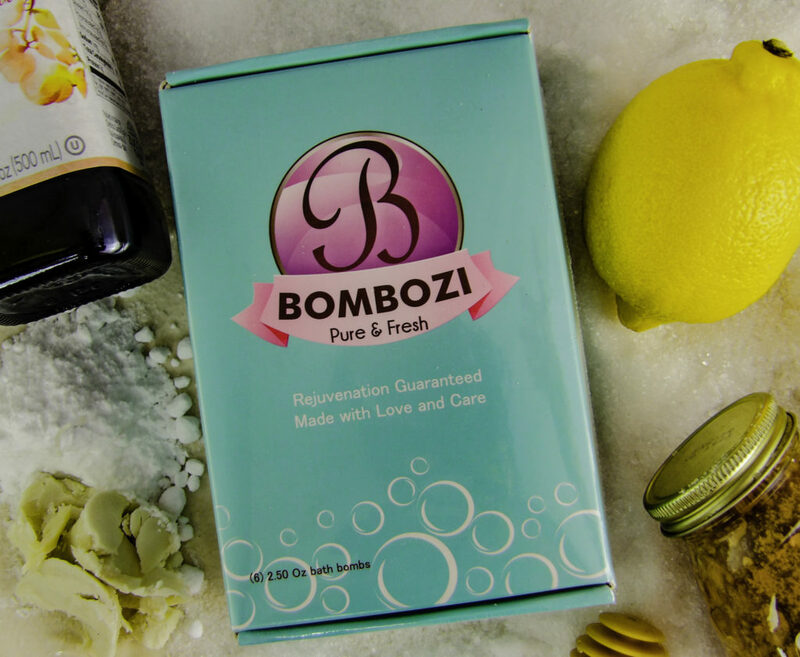 See the video at the end of this post to watch a Bath Bomb by Bombozi in action! Lovely swirls of foam and fizz! I found the bath bombs to be highly moisturizing to my skin, even the rough dry skin on the cuticles, feet, knees, and elbows, but I did not feel greasy and the tub was not left slippery or with a residue. The ingredients were all gentle but effective. 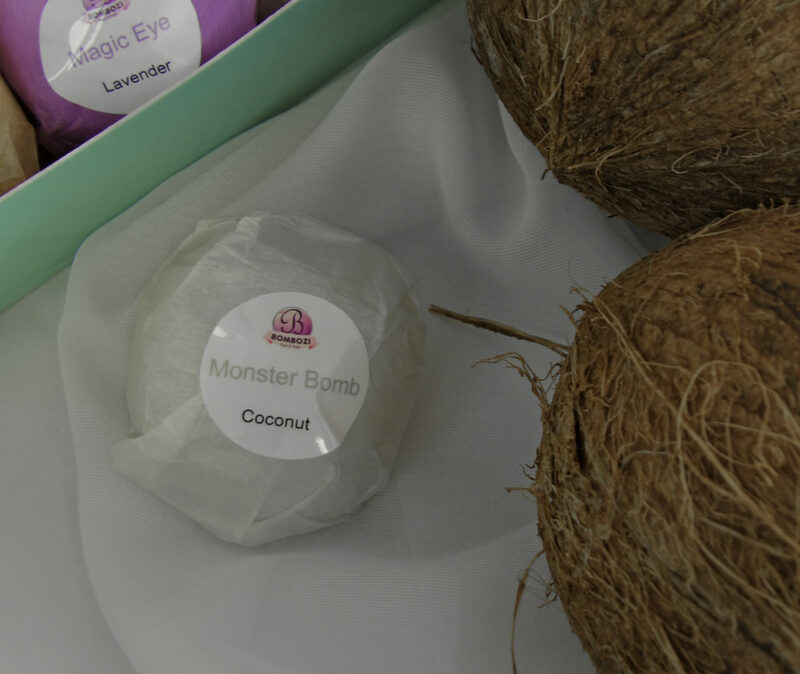 Each bomb has a scent that lasts through the bath experience without being hit-you-in-the-face overpowering, it is scented just enough. although I did not find that it lingered on my skin afterward, which I prefer. 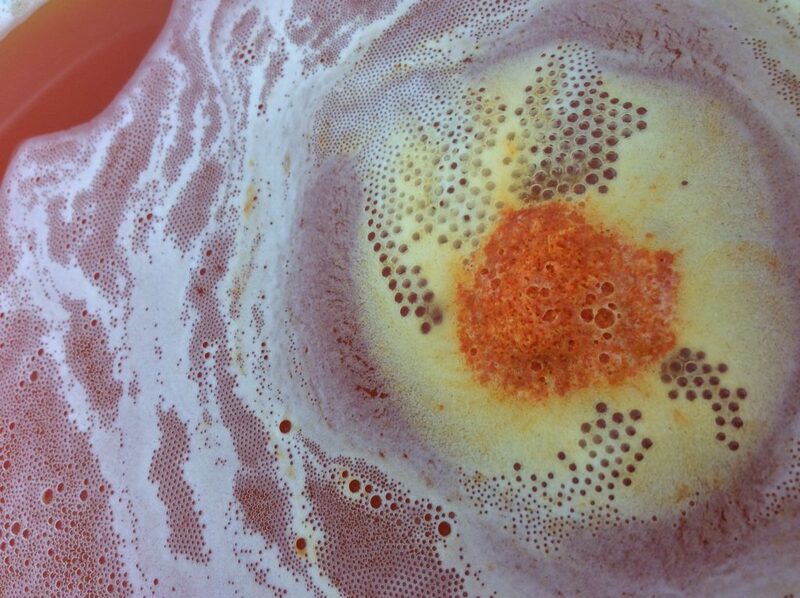 While you can use more than one bath bomb if you desire, there really is no need as one gets the job done to leave skin smooth and soft and to give the water that relaxing fizzy feeling. Some potential combinations might be combining the Vanilla with the Lavender, Coconut, Mandarin or Sandalwood, for example. 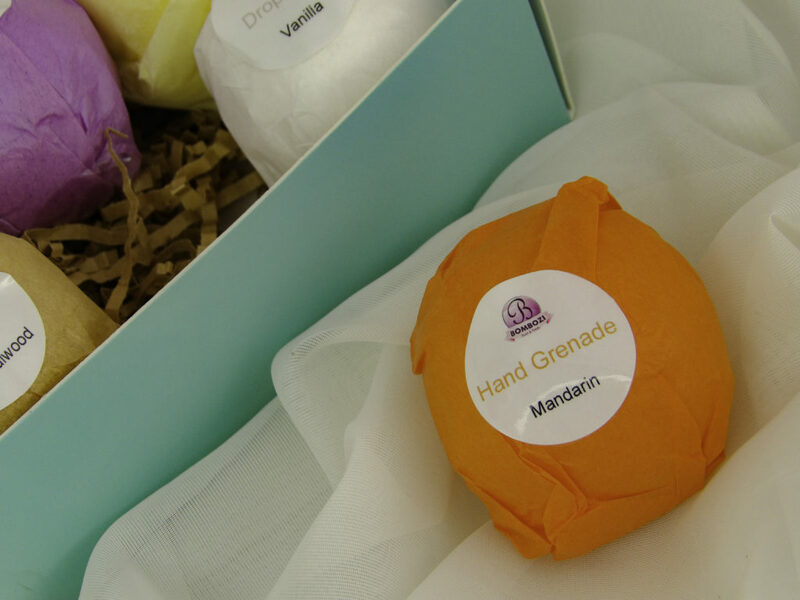 An enjoyable indulgence that helps me unwind before bed, I really like that there is no need to scrub away a post-bath bomb debris film off the tub after use like many bath bombs tends to leave. For me, having to scrub out the tub after a bath takes away all the relaxation. I also like that I can identify every ingredient in the bath bomb so it feels safe to soak in and not expose my skin to unnecessary chemicals when all natural organic ingredients can safely make my skin soft and be just as relaxing. 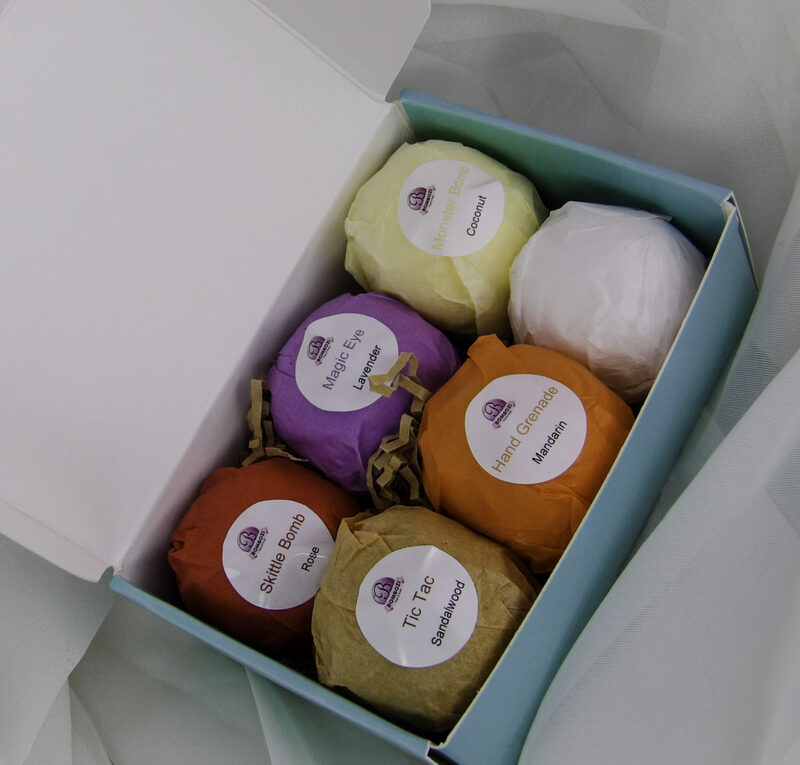 A universally appreciated gift by women of all ages, this gift box is ready for gift giving for yourself or a friend to reinvigorate, cleanse, moisturize and rejuvenate skin, leaving it naturally soft and smooth with no post-bath clean up to ruin the relaxing effects. 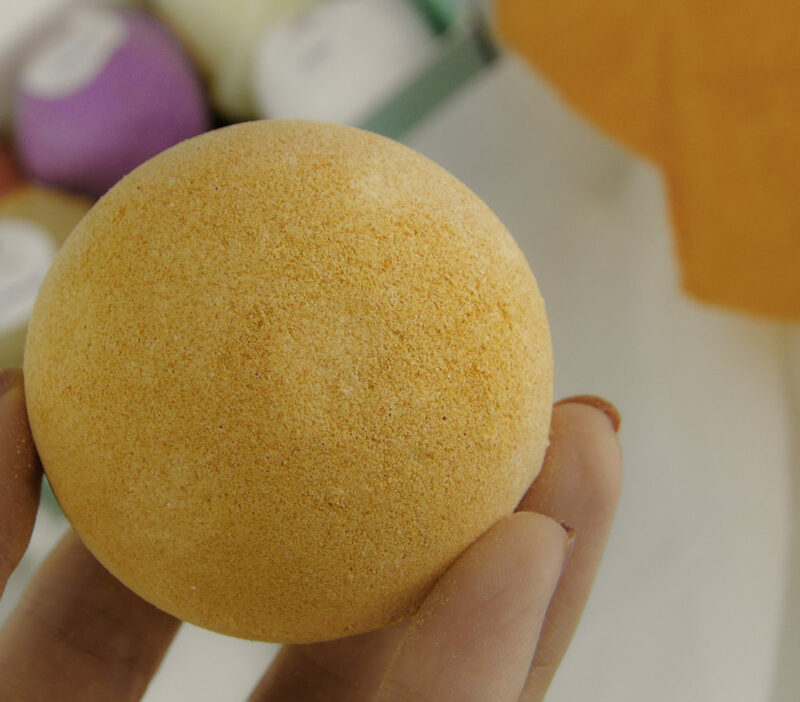 Each scented, organic, handmade bath bomb is cruelty-free. 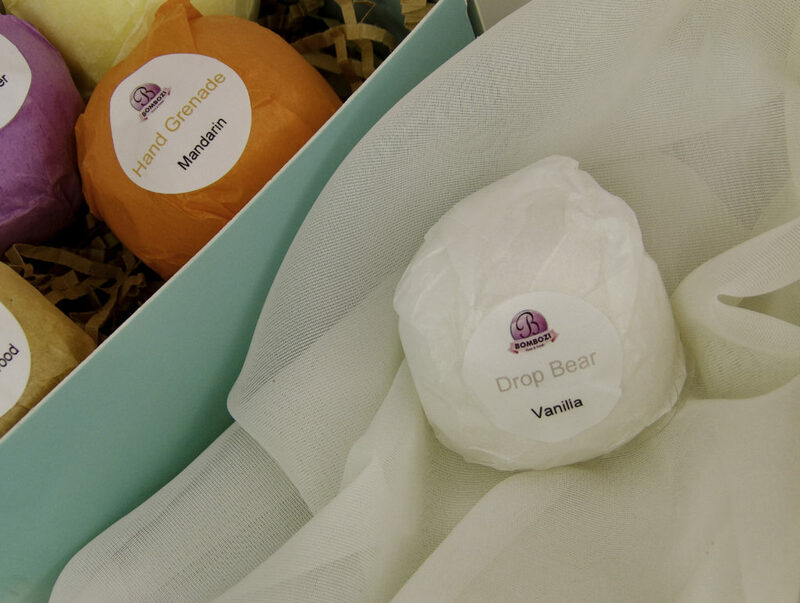 Don’t feel guilty treating yourself to a DIY spa night to recharge and reset, as these bath bombs come at an excellent price point, making them a no guilt in an indulgence that won’t break the bank. 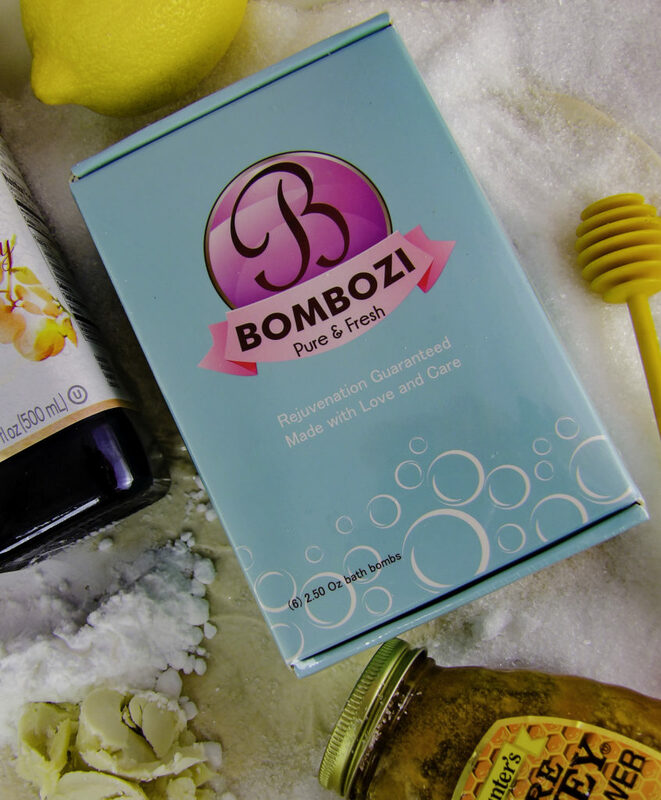 Style Chicks received the Bath Bombs by Bombozi Gift Set in exchange for our unbiased review and received compensation for our time and effort. However, our experience with the product and the opinions expressed in this review are 100% ours. Want to try charcoal for tooth whitening, but have sensitive teeth? Charcoal removes wine, coffee, and tea stains quickly but can lead to tooth sensitivity for some people. 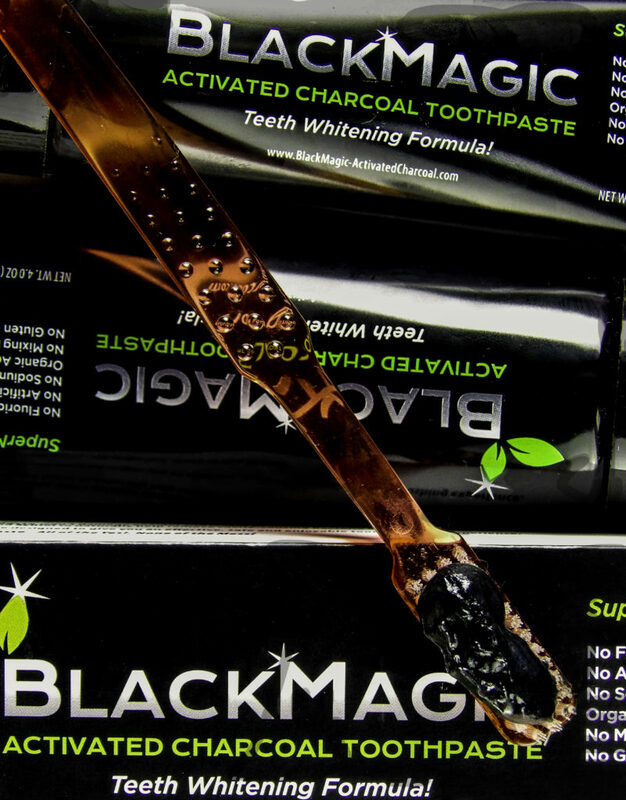 A safe way to whiten teeth naturally is BlackMagic Activated Charcoal Toothpaste. The charcoal is combined with gentle but effective organic ingredients to ensure safe and gentle tooth whitening. 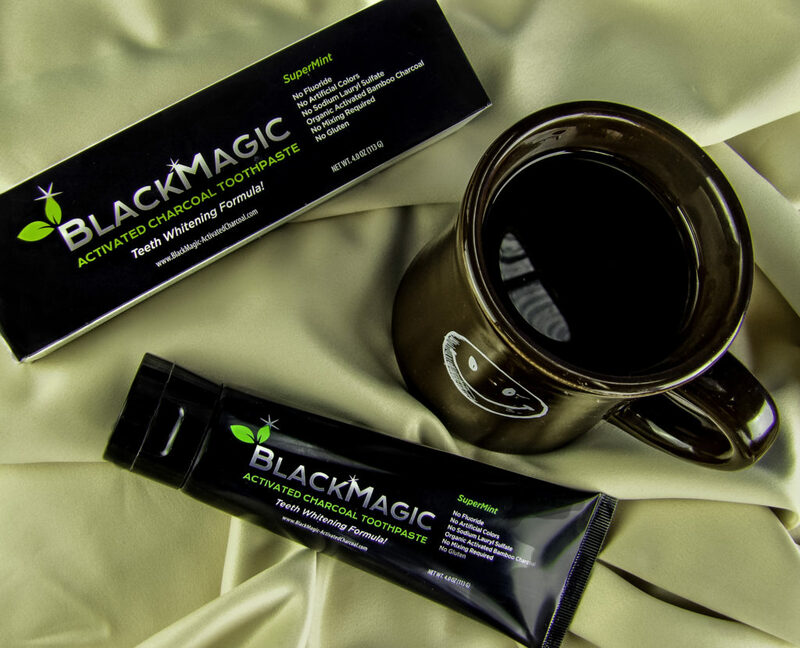 BlackMagic Activated Charcoal Toothpaste is made of all natural ingredients and there is nothing to mix together. 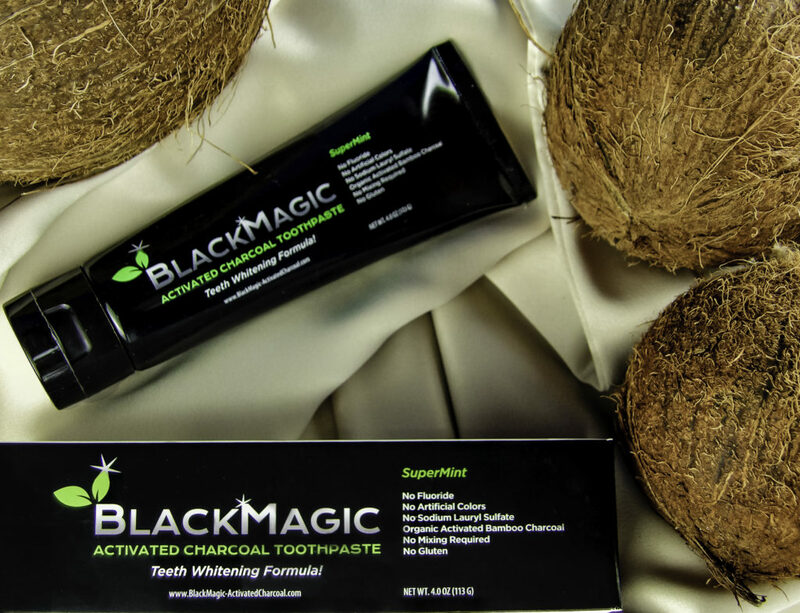 BlackMagic Activated Charcoal Toothpaste is special because the charcoal is combined with gentle but effective ingredients including Coconut Oil, Tea Tree Oil, Baking Soda and other ingredients so you get all the whitening properties without the harsh irritation. 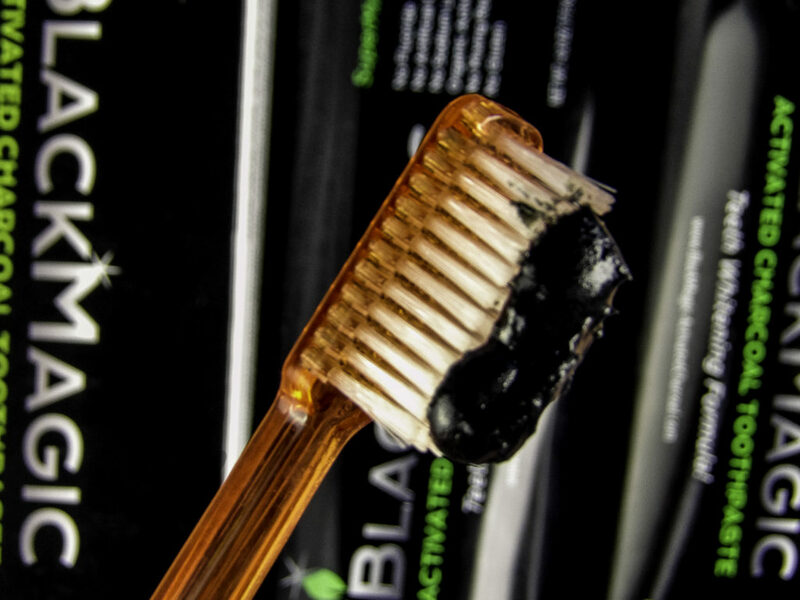 Whitening teeth with charcoal can be a messy proposition, so having it come in toothpaste form makes it much easier to use. But for best use, be mindful of light or white fabrics when brushing the teeth, with most toothpaste, a small speck is not very noticeable on clothing, but any charcoal on fabric is obvious and more difficult to remove. 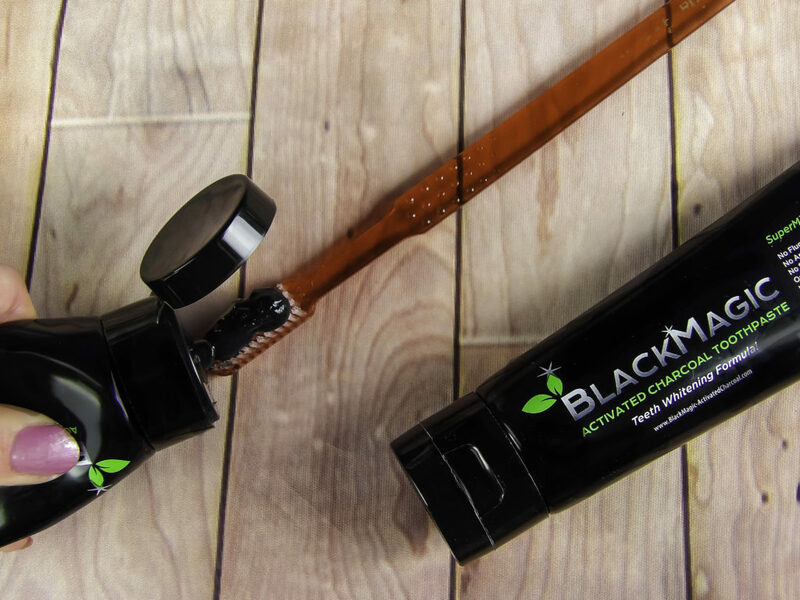 BlackMagic contains Activated Charcoal which is a bamboo charcoal, also known as activated carbon. Charcoal whitens and purifies, eliminating stains and removing impurities. Do you know what is in your toothpaste? For something we put into our mouths, we often don’t pay much attention to what is cleaning our teeth. There is a host of chemicals, artificial coloring and flavoring, abrasives and bleach-based whitening agents in most commercial toothpaste. The inventor of BlackMagic Toothpaste wanted a safe way to whiten teeth naturally. The BlackMagic Activated Charcoal Toothpaste box says the toothpaste contains: “Water, Xylitol, Activated Charcoal, Organic Coconut Oil, Tea Tree Oil, Diatomaceous Earth, Baking Soda, SuperMint Flavor (Organic Wintergreen Essential Oil, Organic Spearmint Essential Oil), Citric Acid, Xanthan Gum”. How does the combination of these ingredients help whiten teeth? Baking Soda is a mild abrasive that naturally cleanses teeth. BlackMagic toothpaste squeezes out of the tube like regular toothpaste, although the texture is somewhat firmer at first and then it softens a bit. It does not take much toothpaste to do the trick, my normal amount of toothpaste as seen in the photos below was actually more than necessary, after the first time I started to use about half of that amount per time. It is highly pigmented, the kid in me enjoys seeing what my mouth looks like while brushing. Following directions, I brush my teeth for two full minutes. While brushing, my teeth and basically the entire mouth was covered in dark pigmented black, which is a strange thing to see! I swished my mouth out with either mouthwash or water after use and there was no remaining black powder residue. It tasted like fresh mint. I am an avid coffee and tea drinker, and I love other “staining” foods like dark chocolate, so any whitening product has its’ work cut out with my teeth. After twice a day BlackMagic toothpaste use for about a week so far, and my teeth were noticeably brighter, in a natural healthy way, not a fake-overly white way that can happen with some peroxide based teeth whiteners. The best part was they were whiter without irritation to my gums or to my lips, and brushing my teeth with BlackMagic is much faster than whitening strips or trays. If you are looking for a safe, organic, effective way to use charcoal to whiten your teeth, yet want to protect sensitive teeth and don’t want to deal with charcoal powders, BlackMagic Activated Charcoal Toothpaste provides a way to remove stains and whiten teeth safely with an FDA Registered, cGMP certified, ISO 9001 production facility made toothpaste that tastes good and is even safe for kids to use. I also like that the toothpaste contains ingredients such as Tea Tree Oil, Coconut Oil and Baking Soda that promote dental health and kill bacteria. Some whitening toothpastes really only whiten, not clean and disinfect the mouth, meaning that tooth whitening comes at the expense of proper dental care. 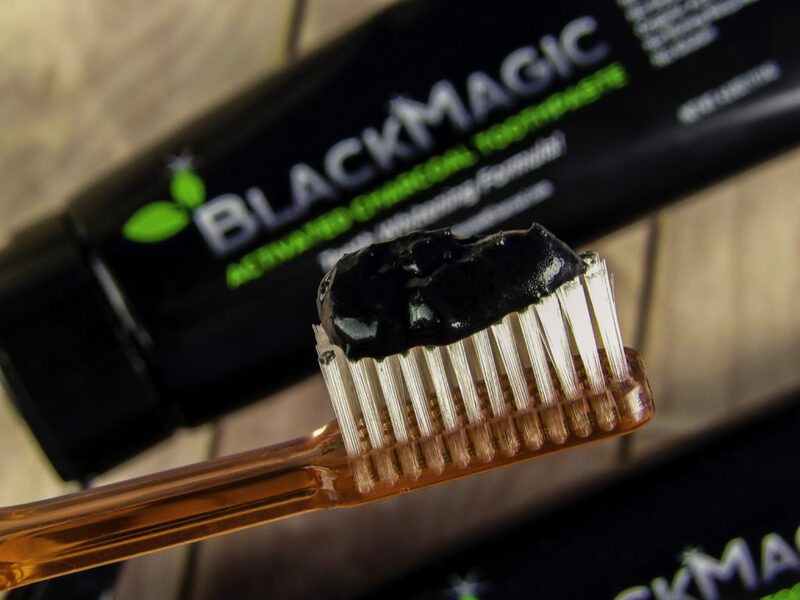 BlackMagic Activated Charcoal Toothpaste is a safe way to accomplish both natural whitening and promote good dental hygiene at the same time. Style Chicks received BlackMagic Activated Charcoal Toothpaste in exchange for our unbiased review and received compensation for our time and effort. However, our experience with the product and the opinions expressed in this review are 100% ours. We love major volume, but hate how most volumizing products leave hair weighed down, dull, and sticky! That’s why we love Pure Glam Volumizing Spray. Pure Glam Volumizing Spray is made with natural ingredients that are actually good for your hair! Corn-based starch provides moldability, lift, and frizz control without weighing hair down. 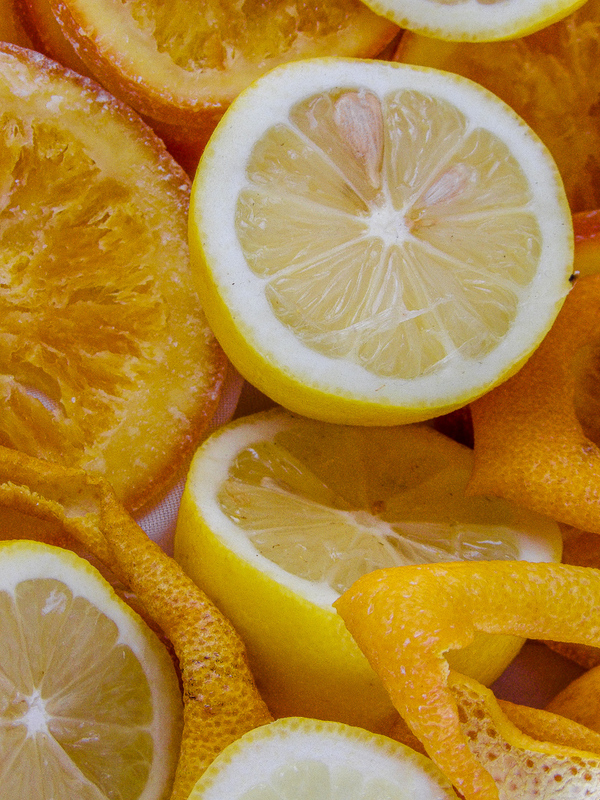 Organically Certified Citrus Oil along with Acai Berry Extract leave hair soft and moisturized. Good for all hair types, Pure Glam Volumizing Spray creates soft, touchable, shiny hair with tons of volume that lasts! For Volume, spray at roots and blowdry. For Volume and Body throughout your hair, spray from roots to ends and blowdry. If you are looking for an effective, natural, cruelty-free, Vegan, Gluten-free volumizing product, check out Pure Glam Volumizing Spray! Find Pure Glam Volumizing Spray at http://www.OrganicBeautyNow.com. Style Chicks received compensation for our time and effort as Brand Ambassadors of Pure Glam. However, our experience with the product and the opinions expressed in this review are 100% ours.